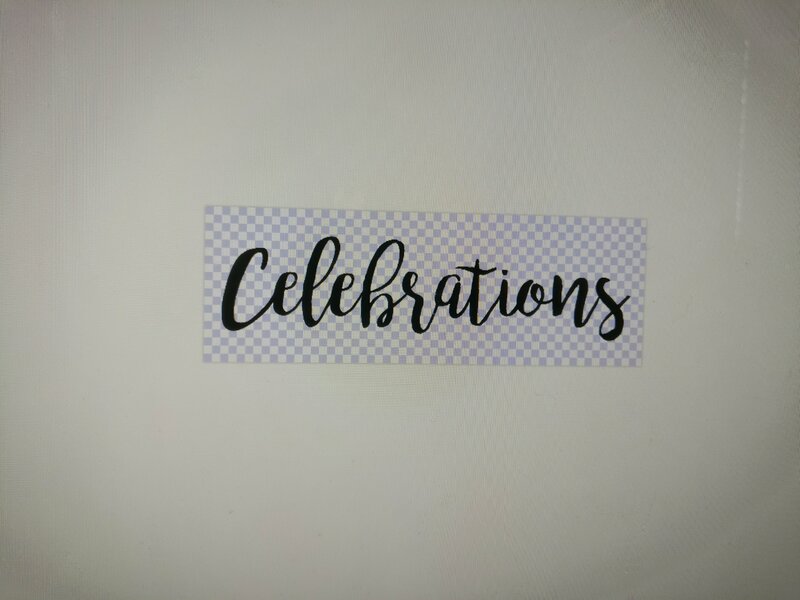 Have you seen Celebrations Boards around? 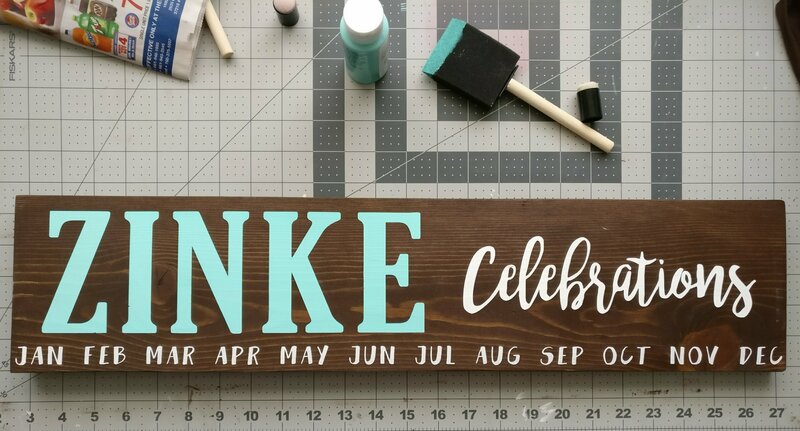 They are the coolest way to remember birthdays and anniversaries! 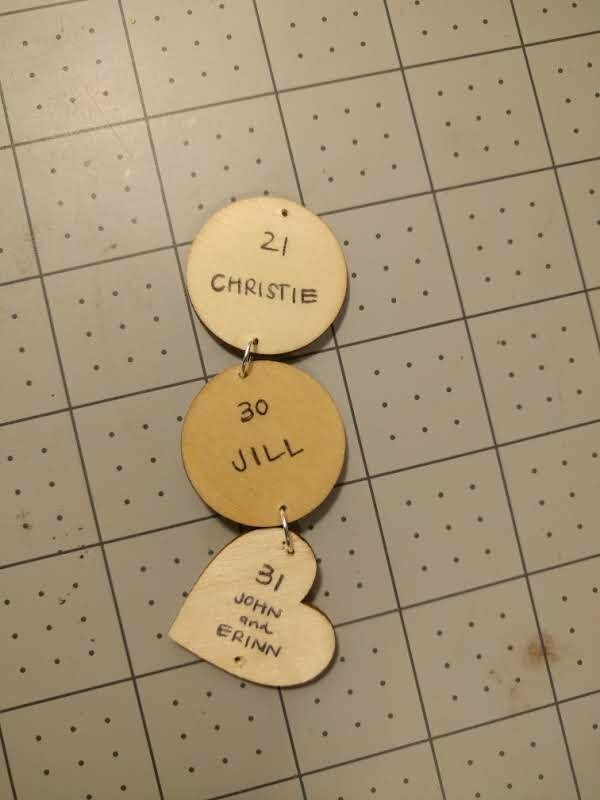 You hang the circles and hearts under each month, and write the names and dates of people’s celebrations. 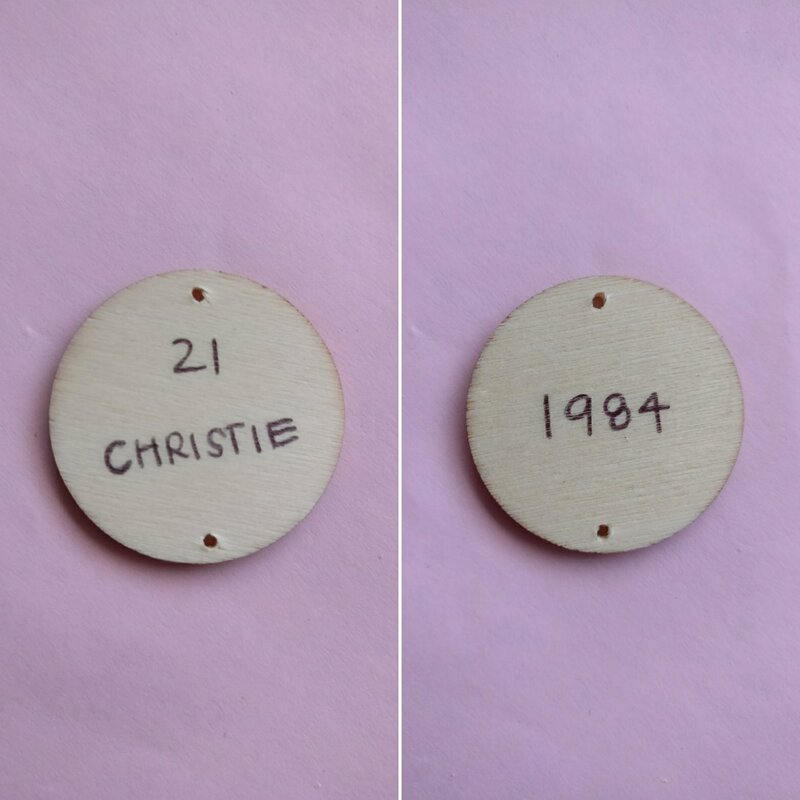 Circles for birthdays, hearts for anniversaries. Suuuure, Facebook tells you about those things, but 1. Not noticeably far enough in advance to actually send anything to the birthday boy/girl, and 2. 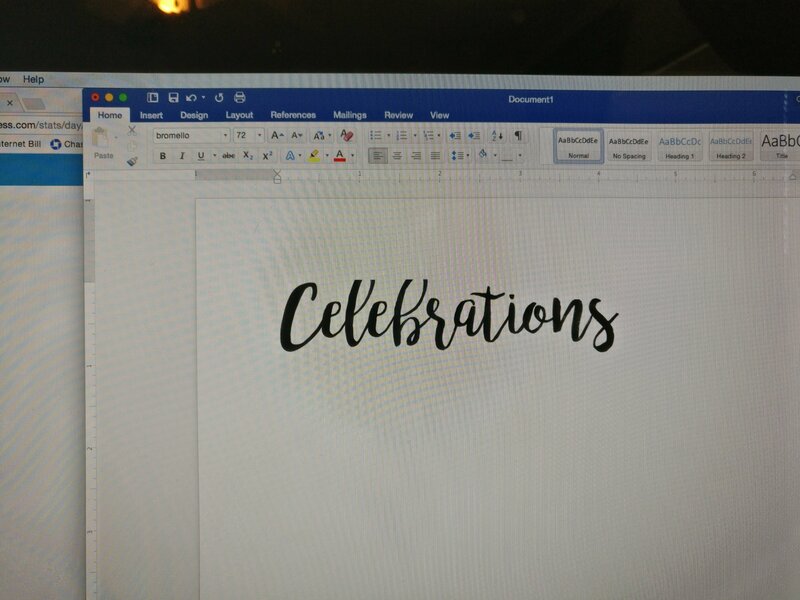 Not everybody has Facebook, or puts their birthday/anniversary on there. For example, young nieces and nephews, or more private in-laws. I have a good friend whose birthday I missed last month, because I relied on Facebook to notify me, and her birthday wasn’t even on there. When I was growing up, I had a really cool aunt who always sent me a card on my birthday (which was no small feat, with how many siblings and cousins I had). 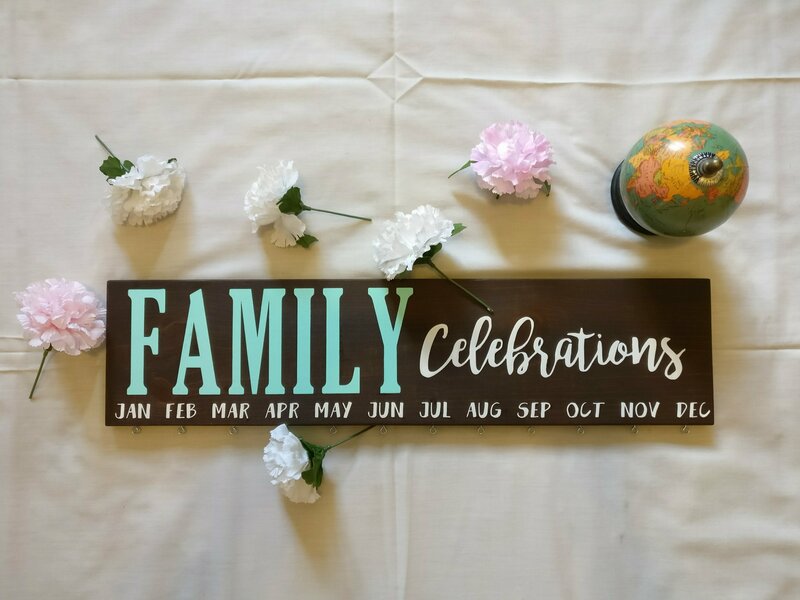 My husband and I decided that it would be fun to be the aunt and uncle who always celebrated birthdays. 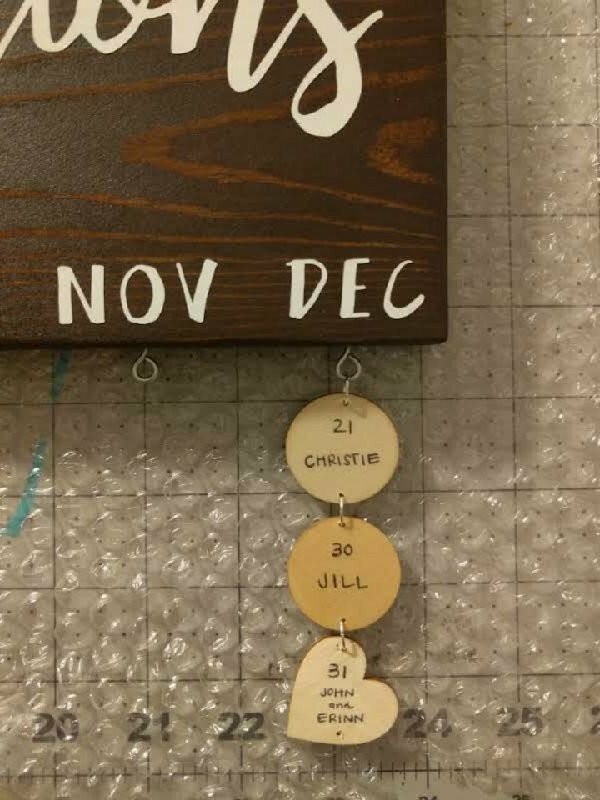 We made a board for my parents, and one for my parents-in-law, for Christmas last year. 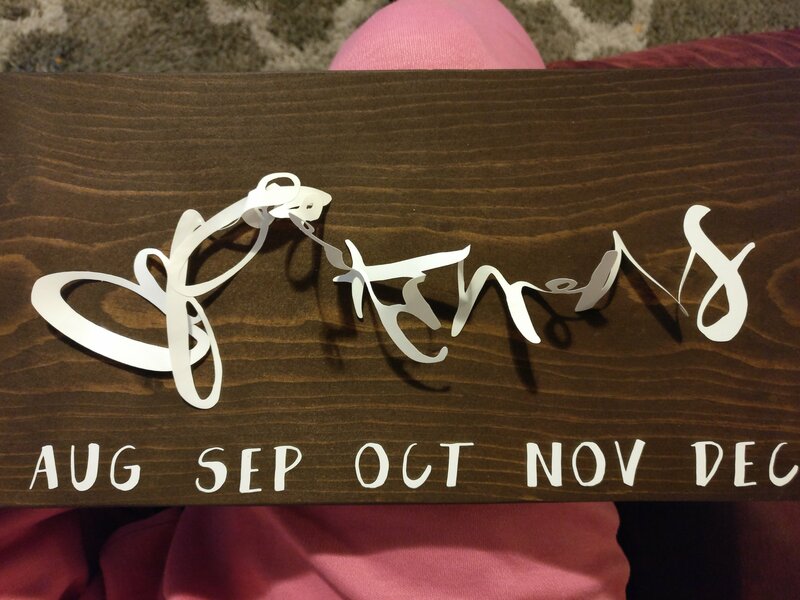 It was fun to give a unique gift that was still heartfelt, and not incredibly expensive. 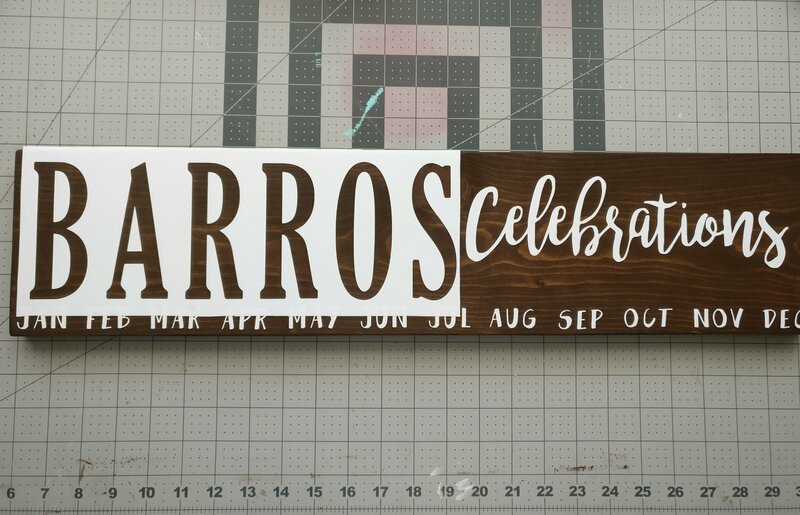 It only took us 8 months to make our OWN celebrations board for our home. That’s how things go, right? But it’s been very helpful, even in the 2 weeks it’s been on the wall. 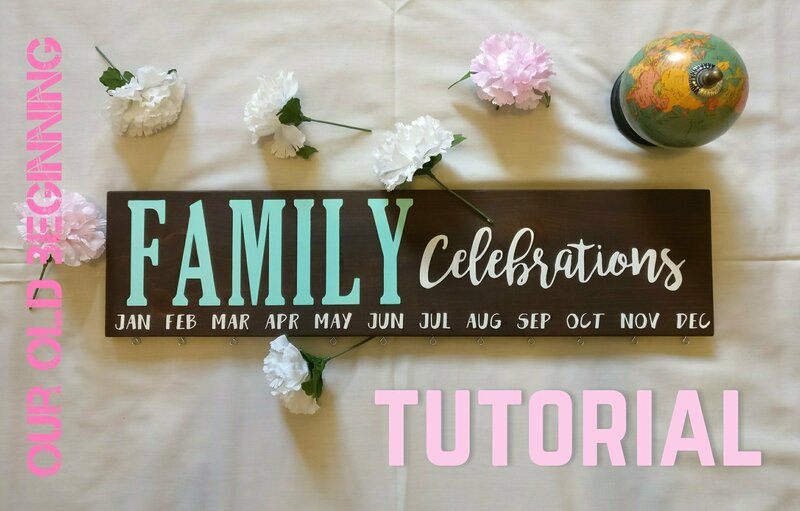 I am here today to give you a tutorial on how to make your own custom Family Celebrations Board! 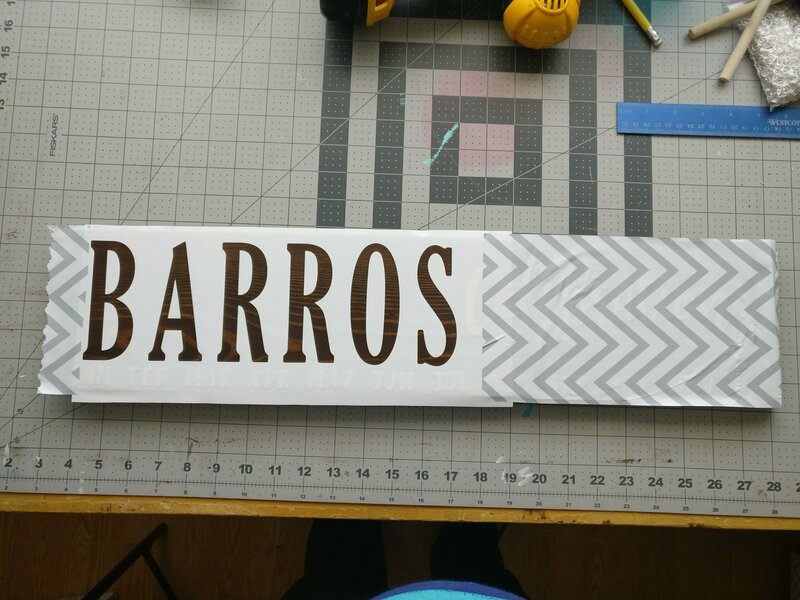 (I know, I’m giving away my secrets, and now nobody will buy my boards on Etsy, blah blah. But it’s a cool project that lots of you can benefit from! 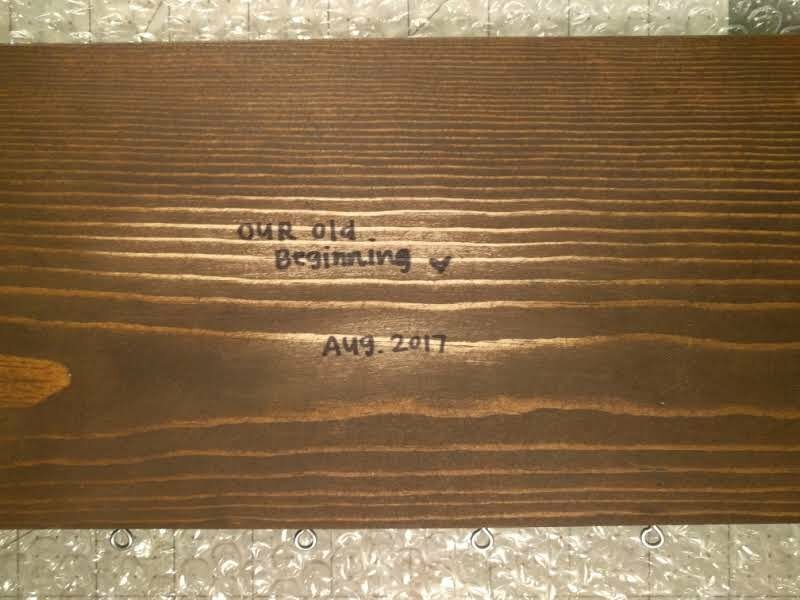 One 1″x6″ pine board. We just go to Home Depot and pick out the straightest board we can find. 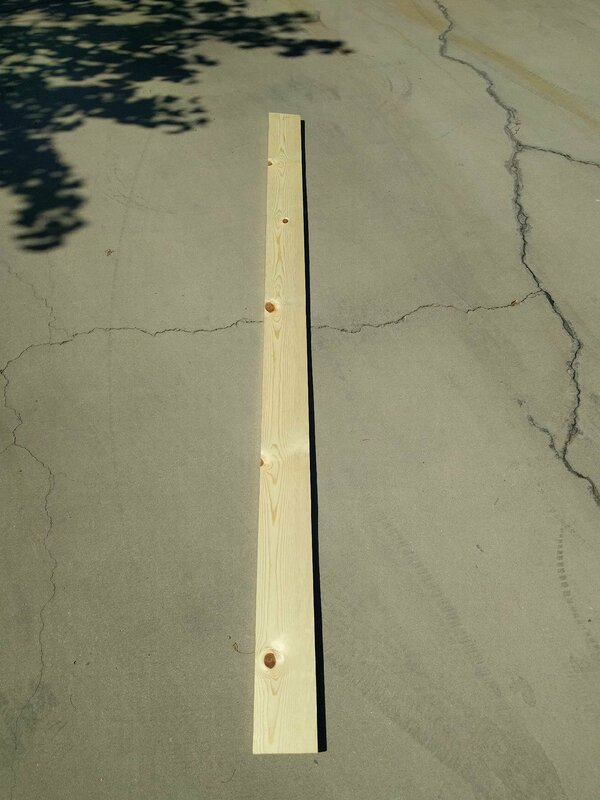 You can also get your 8 foot board cut to length for free there, if you don’t have power tools at home. Your favorite wood stain. 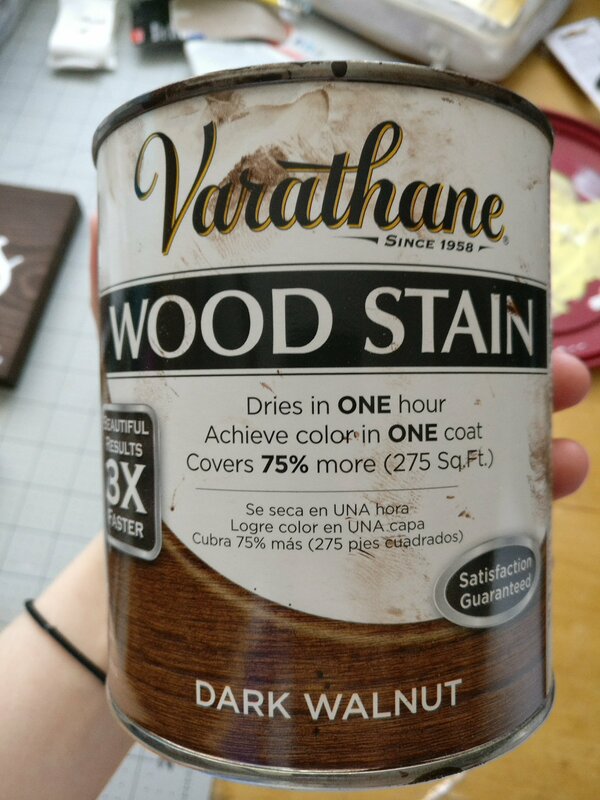 We use this dark walnut stain from Home Depot. It’s the best. You don’t need very much per board. 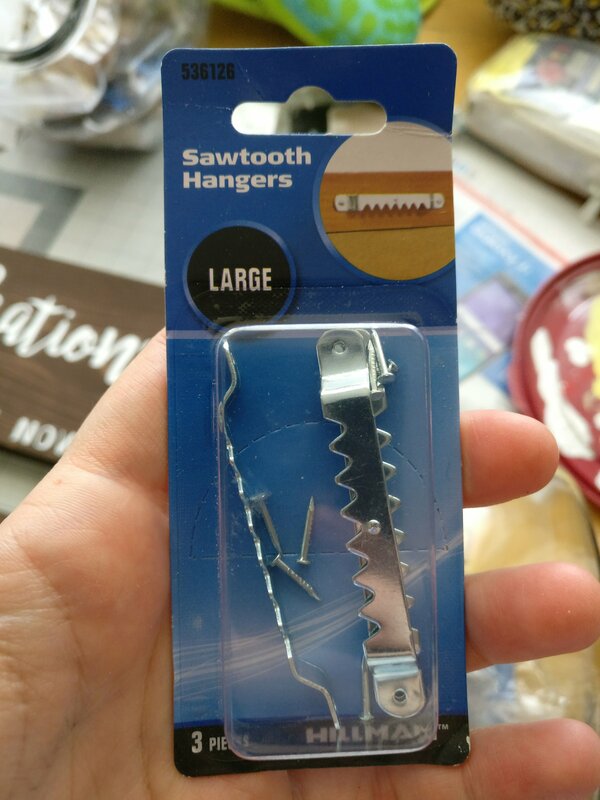 1 sawtooth hook for the back of the board. We just get these ones from WalMart. 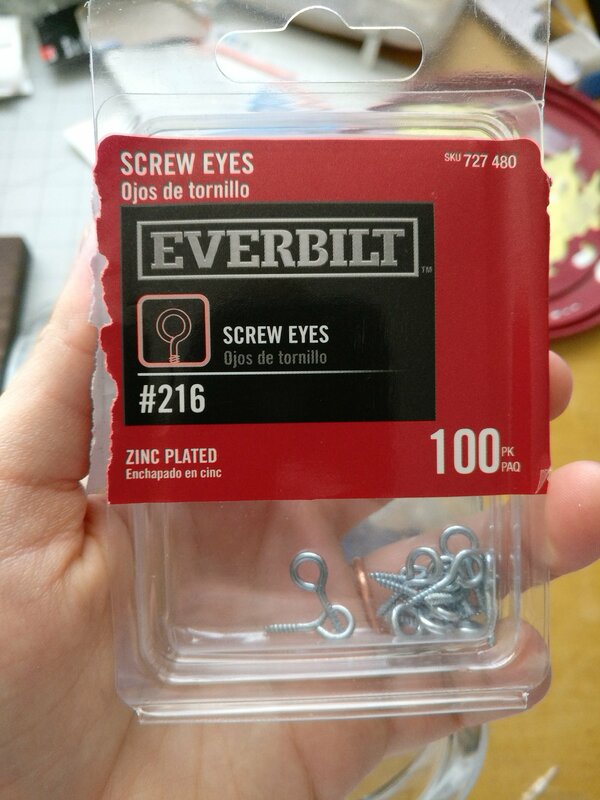 12 mini screw hooks. In bulk, we found them much cheaper at Home Depot. I’m not sure about smaller amounts. 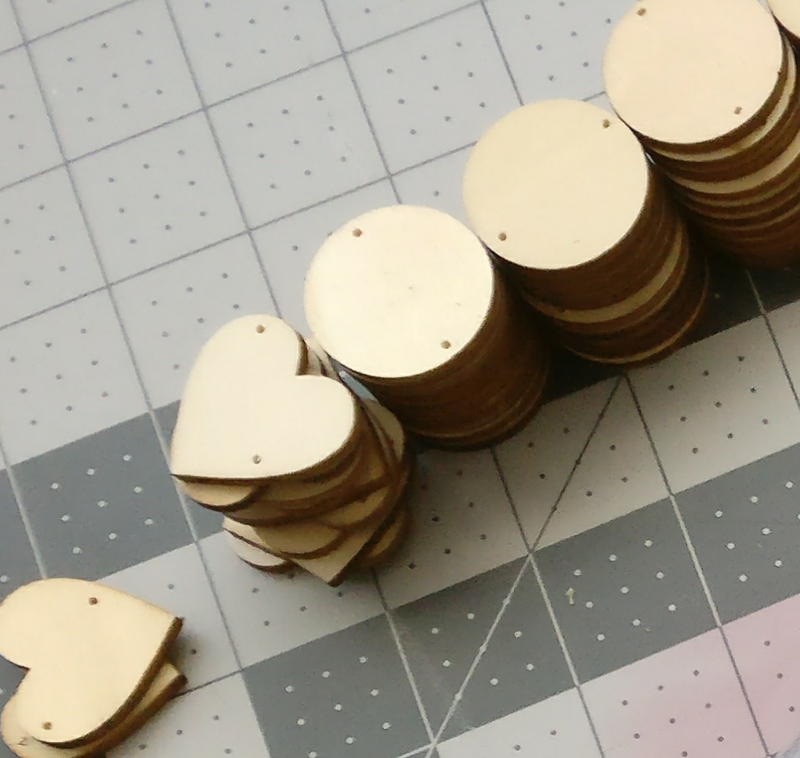 Wooden circles and hearts. 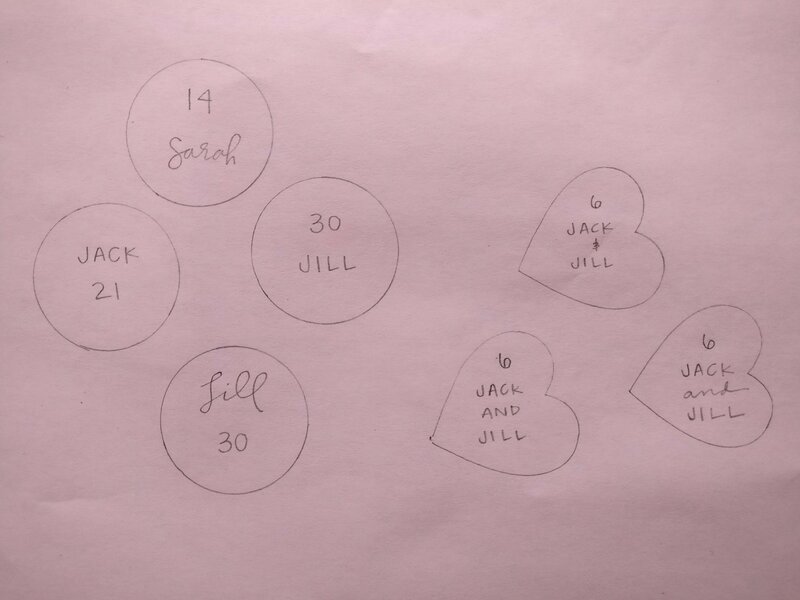 The amount will depend on how many birthdays (circles) and anniversaries (hearts) you have in your family. 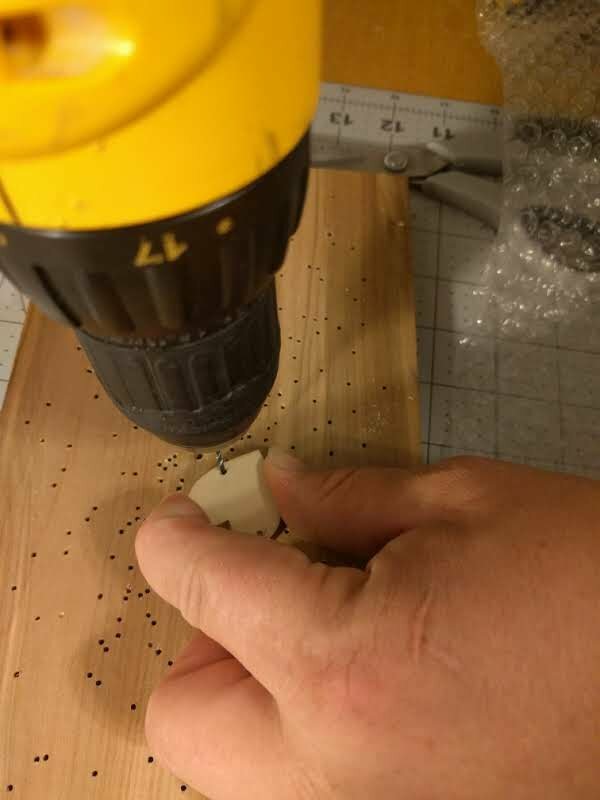 We get them a lot cheaper by buying ones on eBay without holes, and then we carefully drill the holes in them ourselves. 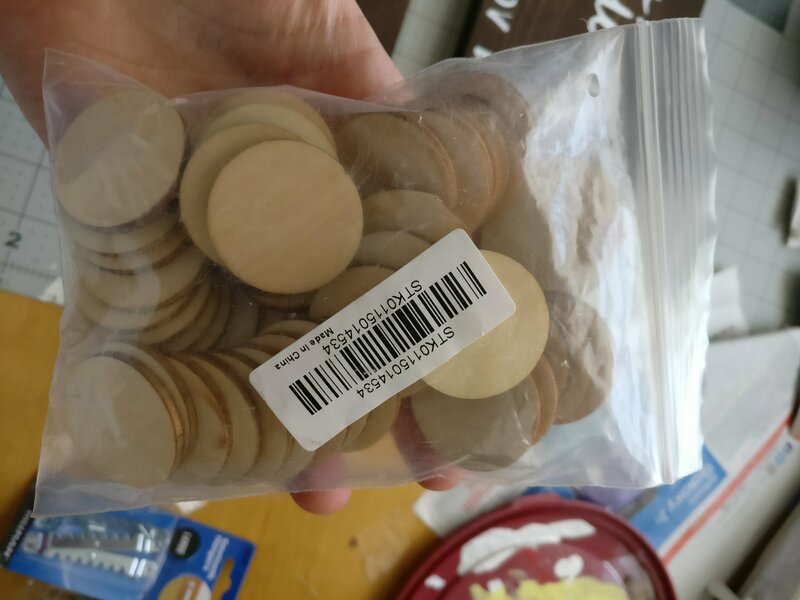 We buy circles that are 30mm wide. 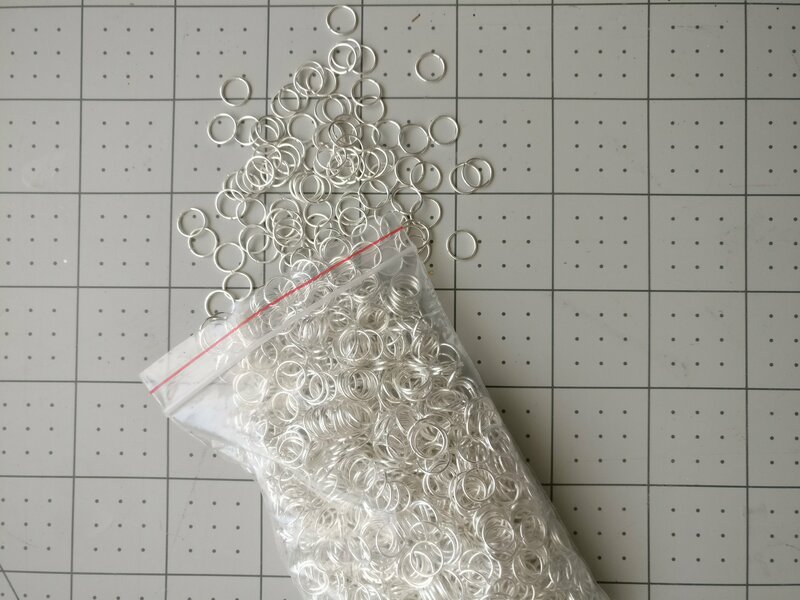 Jump Rings. You‘ll need one for every heart or circle you plan to use. 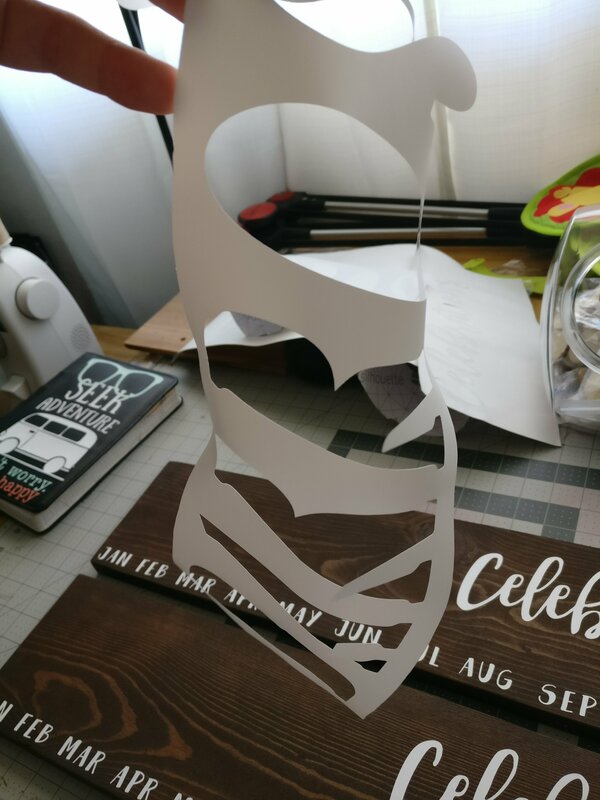 You can get these super cheap on eBay or at most craft stores. Paint, whatever color you like. 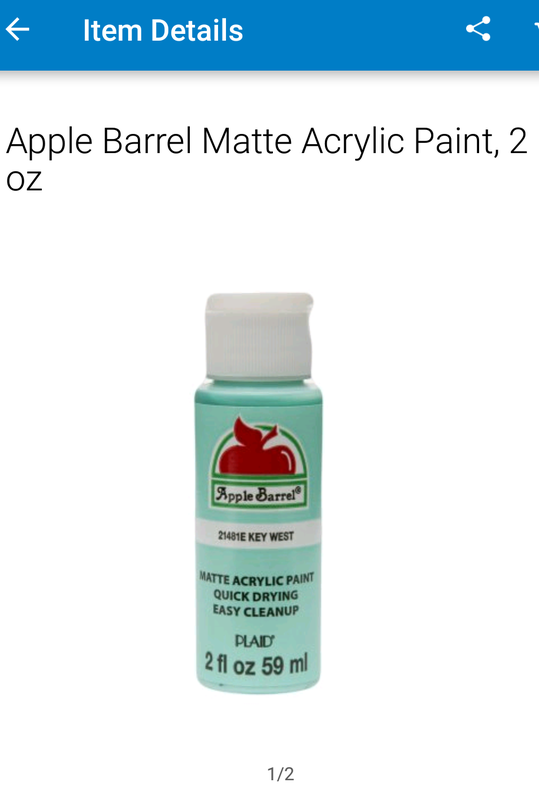 Key West Apple Barrel paint from WalMart is my personal favorite. 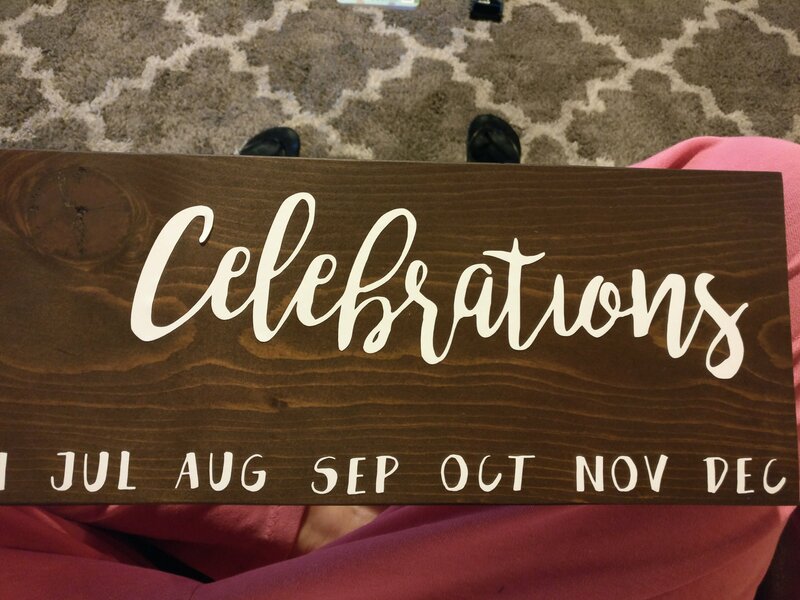 You may decide to paint the months and the “Celebrations” word onto the board, instead of using vinyl. 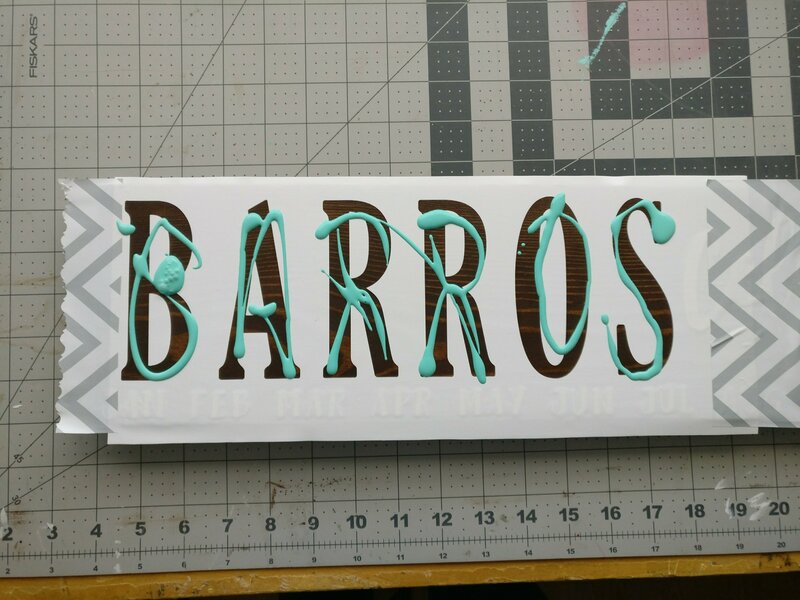 If so, use the same methods for painting the last name that I will show in my tutorial, but be extra careful, and wait even more time at the wait times. I use any white paint for those words. White vinyl. 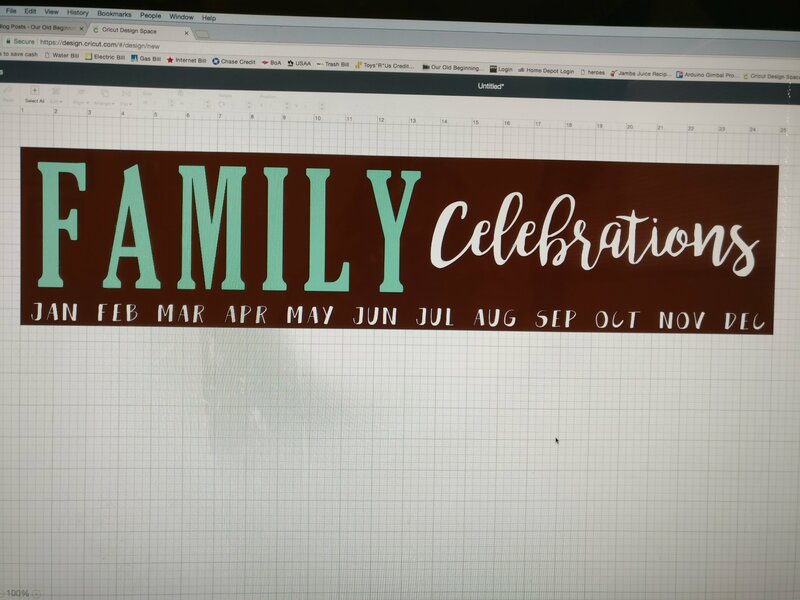 Compare Cricut vinyl with Silhouette vinyl (and other types). It can save you money to shop around, and it doesn’t reeeally matter what kind you use. Make sure to watch for sales and discounts at JoAnn. 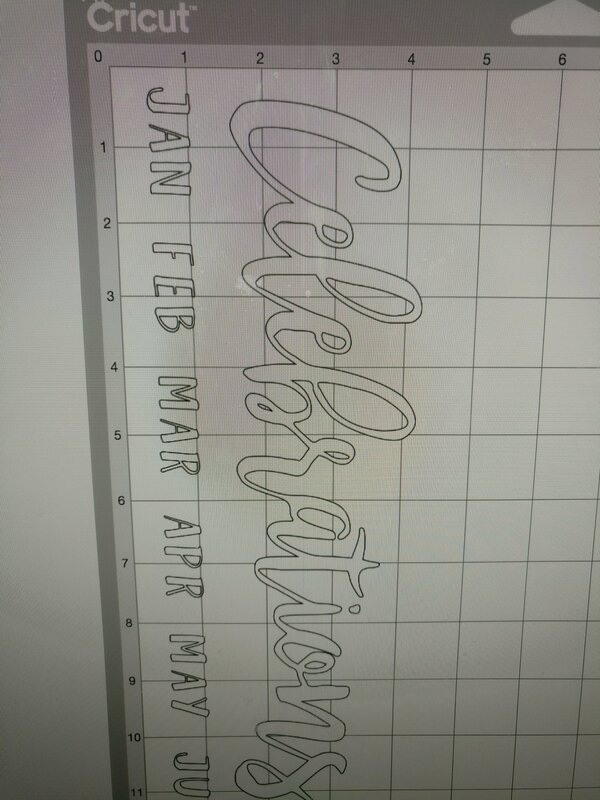 Additional vinyl to be used for stenciling & painting. Rags, foam brushes, cheap plastic gloves, and newspaper. For staining, and painting. 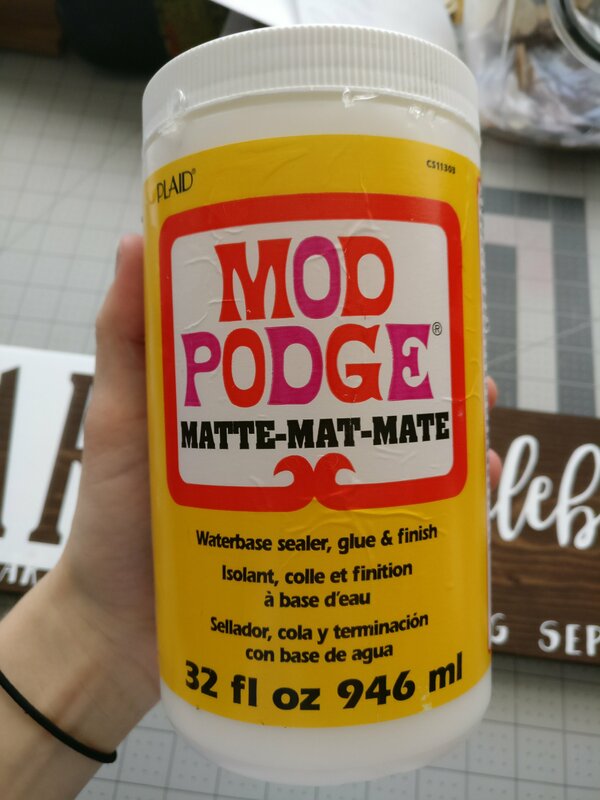 Mod podge and spray-on mod podge. With all of your materials and tools handy, you’re ready to start! Wipe off any wood dust with a slightly damp rag, making sure to not leave any dust particles on the board. – Using plastic gloves will make cleaning up way faster. Trust me. – Don’t wear clothes you like. I was wearing a paint smock, and a splatter of stain somehow still got on the collar of one of my favorite shirts. Don’t risk it. – Check the entire board for drips and runs, as well as for any finger marks. It’s frustrating to have your stain dry with obvious deficiencies. 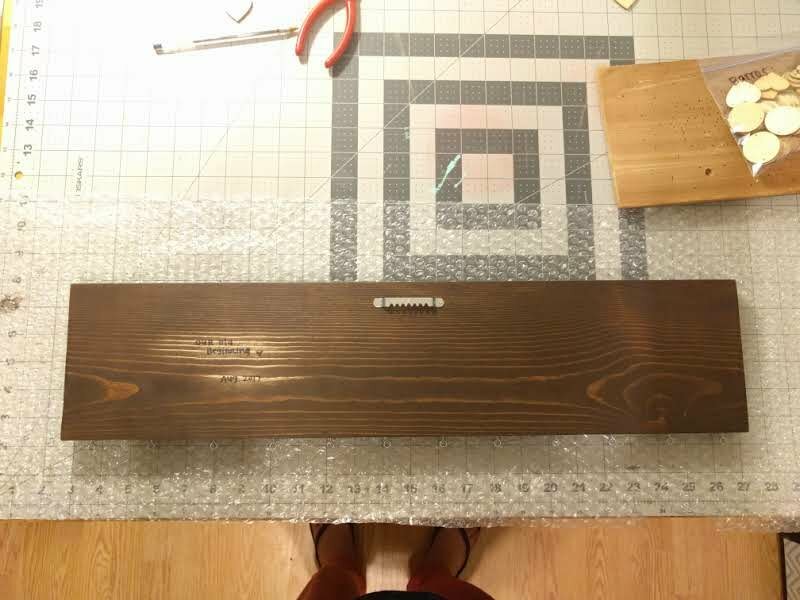 – Prop up the board so that the maximum amount of board is exposed to open air, and wait extra long for the stain to dry (I suggest at least overnight.) 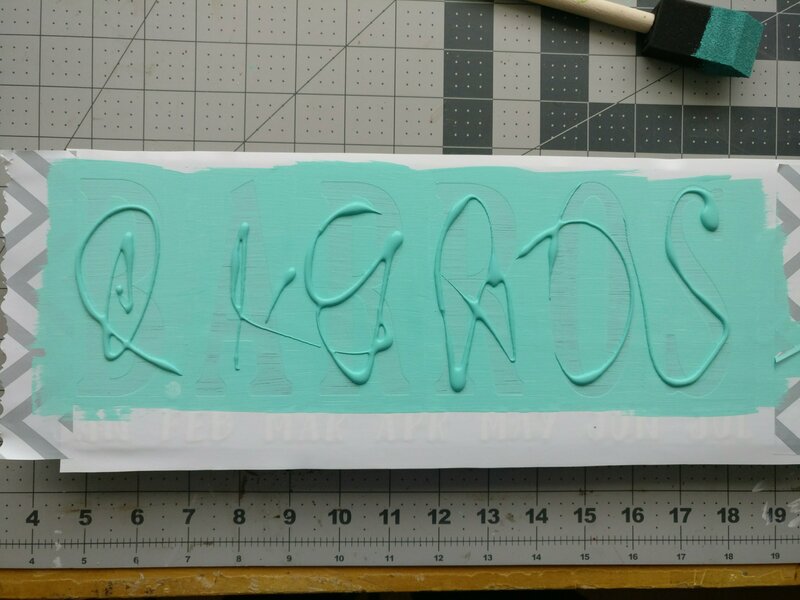 You don’t want weird bubbles or marks to show up because you didn’t let it dry properly before continuing. Now for the cutting! 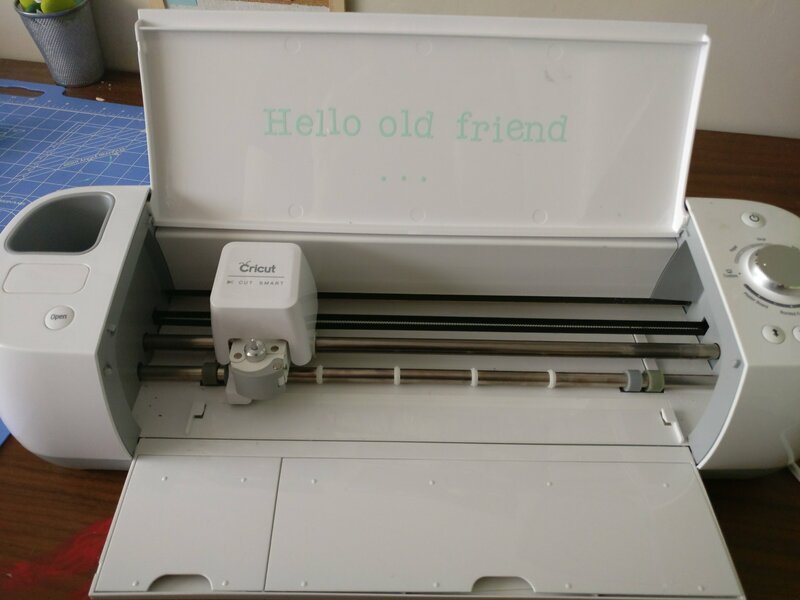 I have a Cricut Explore One, so if you have a Silhouette or even an older Cricut with cartridges, I can’t really tell you how this is all going to work, so… I’m sorry. Also, I apologize in advance for the weird computer alien effect on the pictures. Set up your situation. 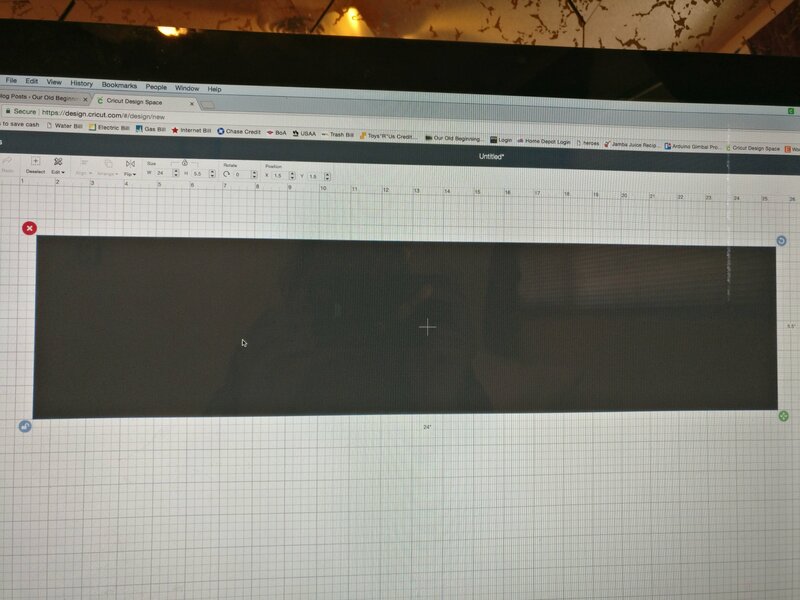 Insert a rectangle that’s 24″x5.5″. 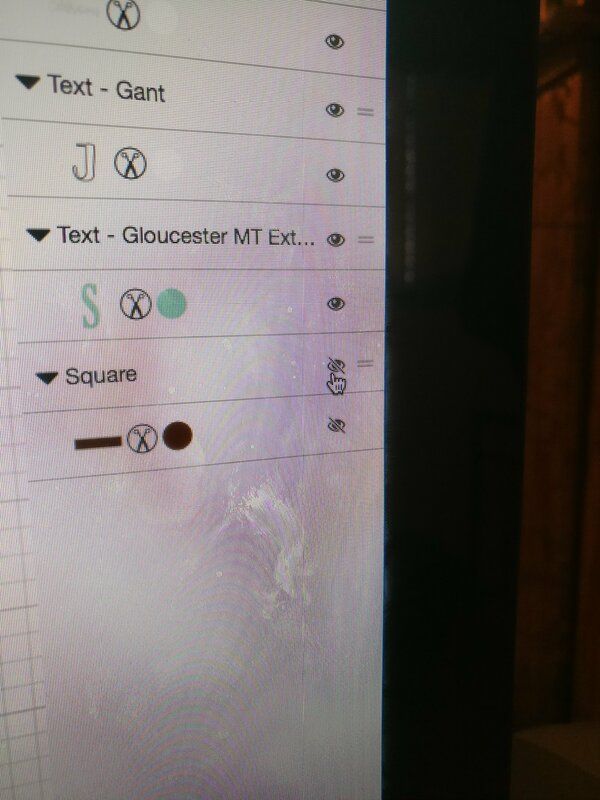 You’ll have to unlock the square. 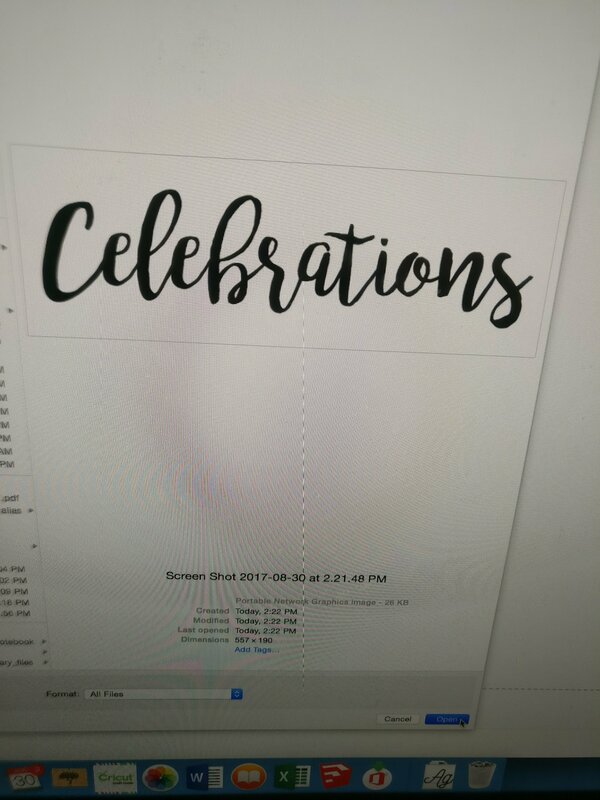 Insert text, and type the last name. 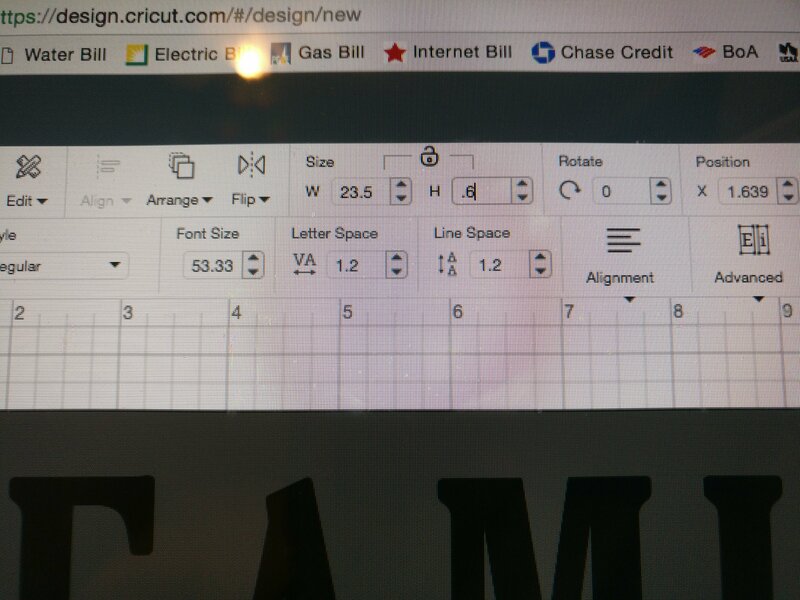 Change the font to the font you want. I use Gloucester MT Extra Condensed. 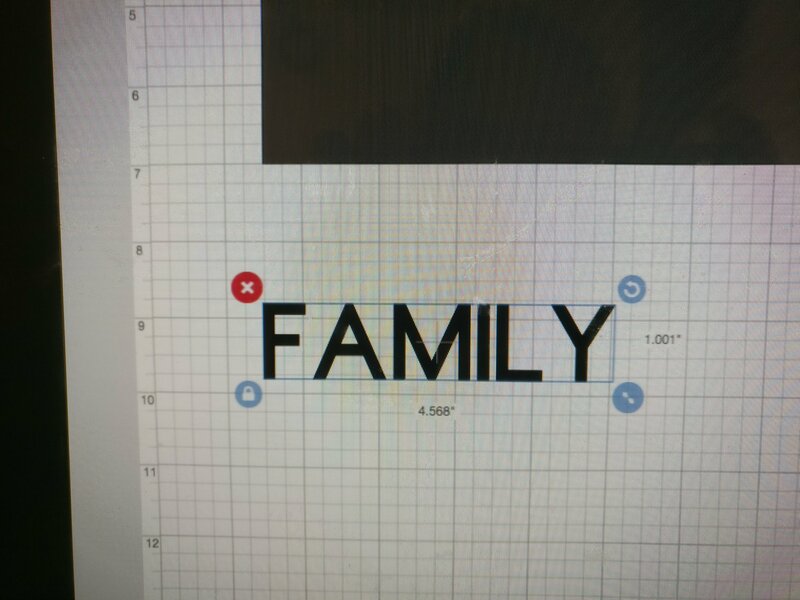 Move and size the name. 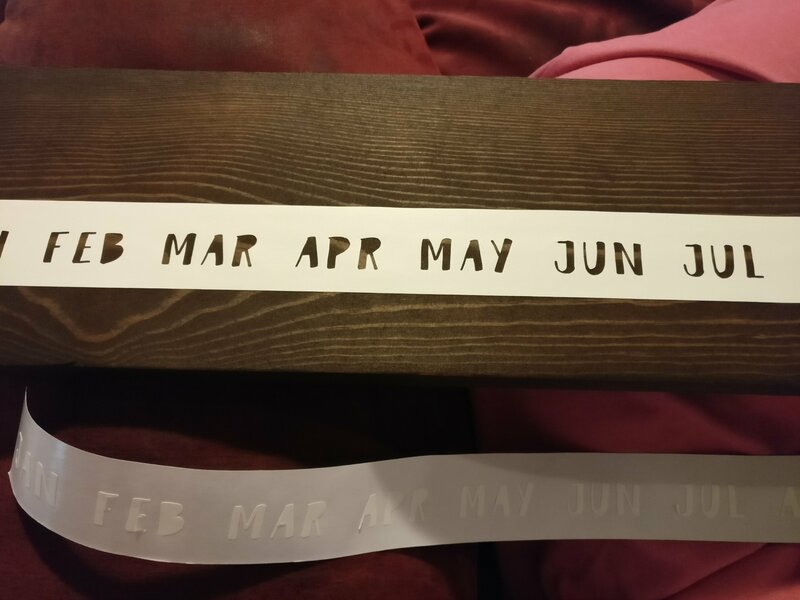 Insert more text, and type in the months of the year. 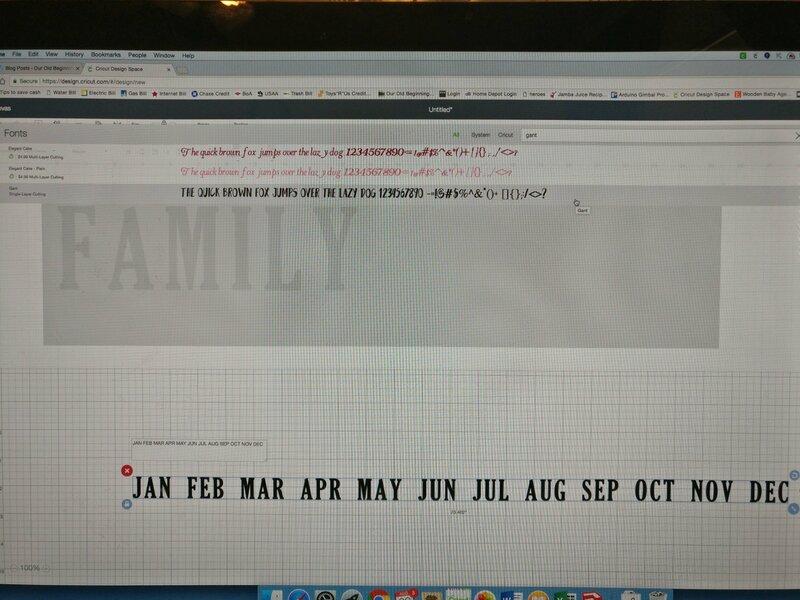 I use the Gant font for the months. 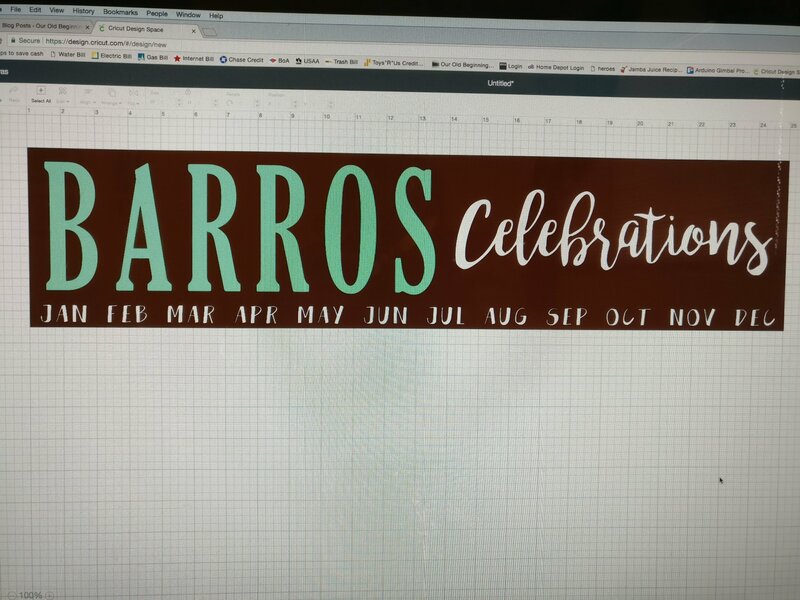 Unlock the months, and then set the width to 23.5″, and the height to 0.6″. Change it to a font you like. 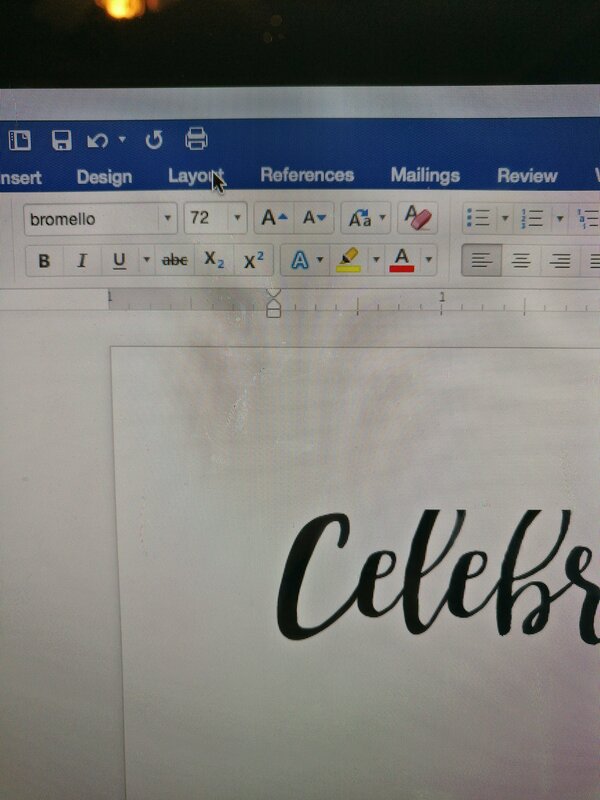 I use Bromello. 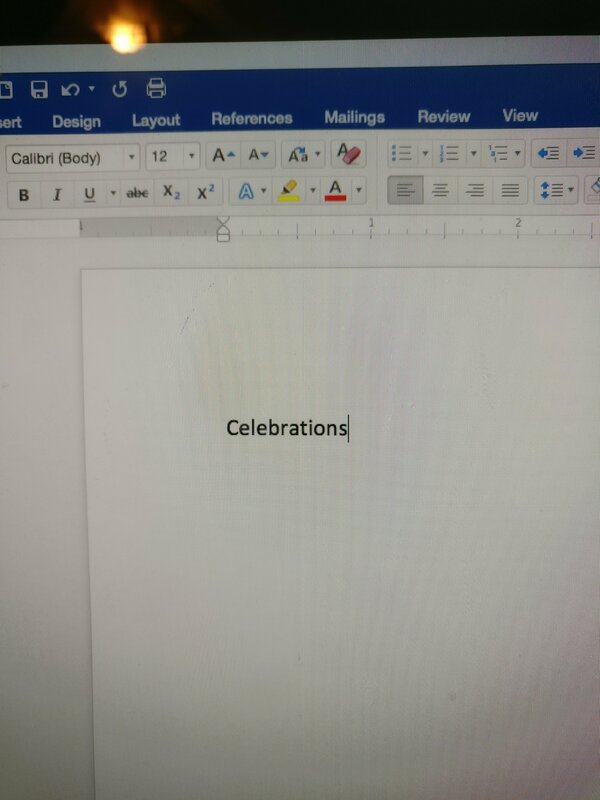 If your word gets cut off, go to the layout tab, and increase the spacing before the word. 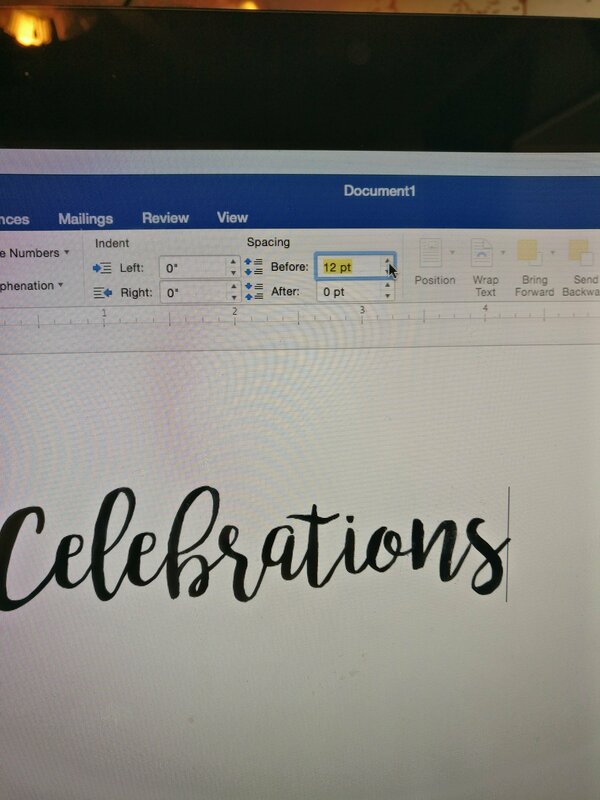 Take a screen shot of your word. 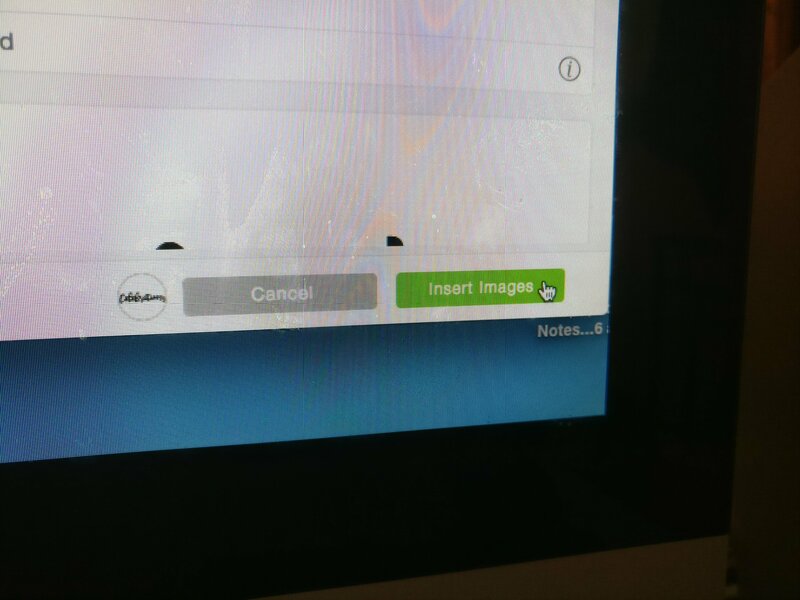 Make sure the cursor isn’t in the shot. 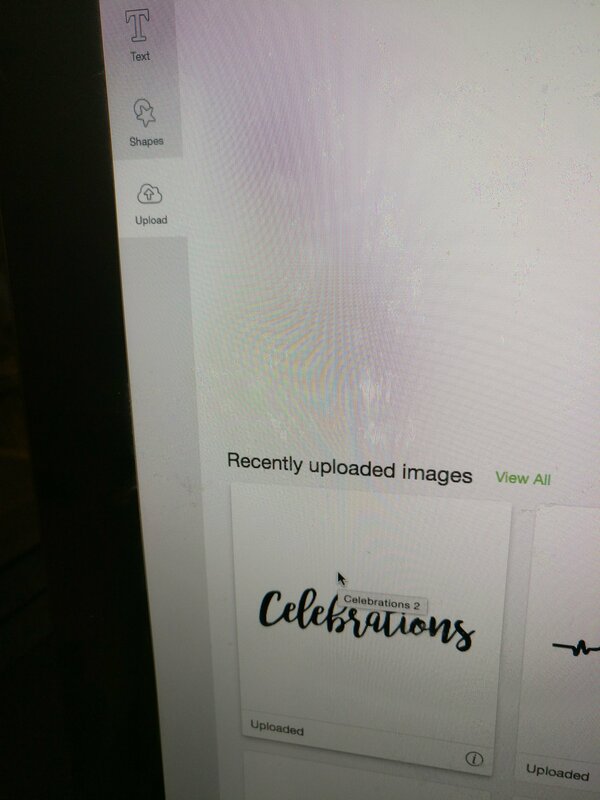 Go back to Design Space, and click the upload tab. 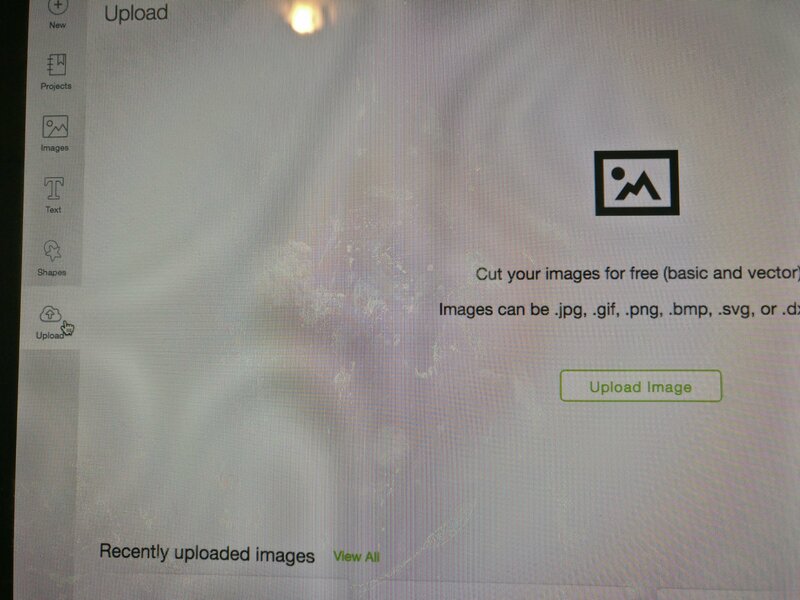 Upload your image… Then browse. 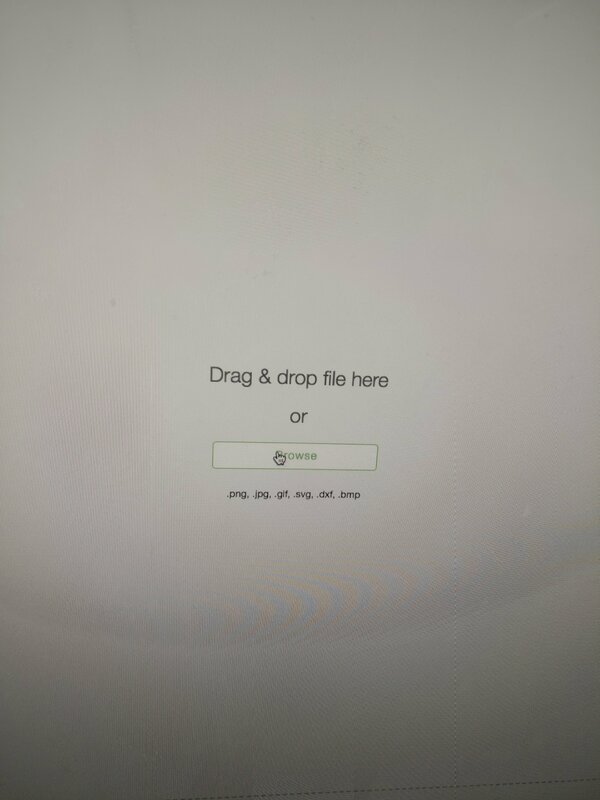 Find (and then insert) the file on your computer. 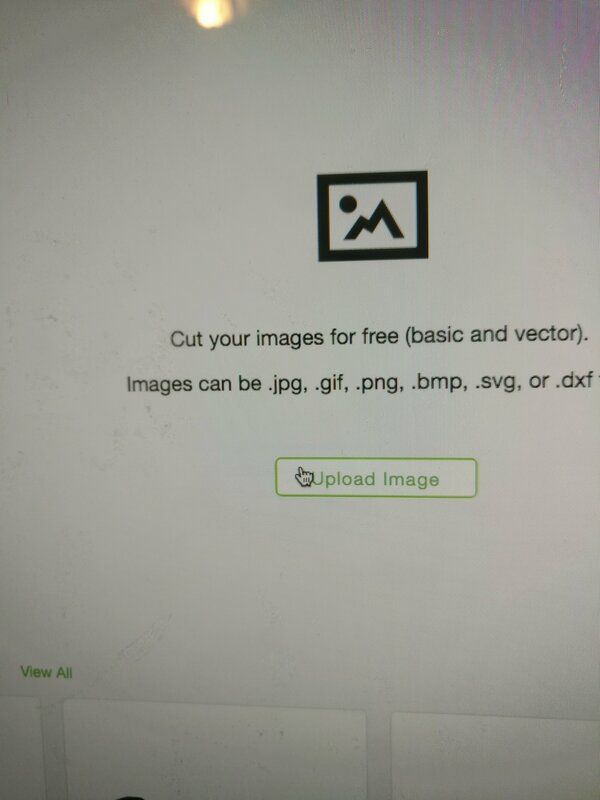 Select simple image… Then weed out the background. Save it as a cut image. 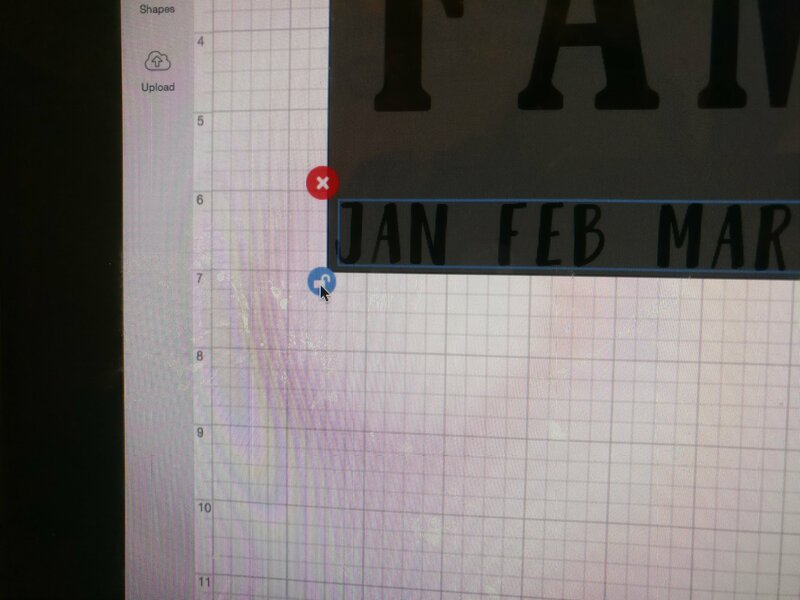 Click on the image and insert it into your project. 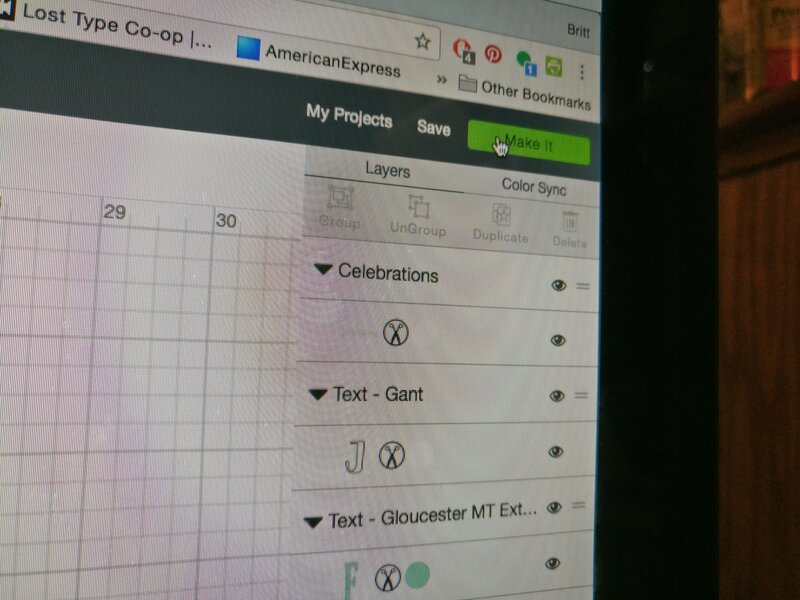 Unlock the words, and adjust the colors and sizes of each component. 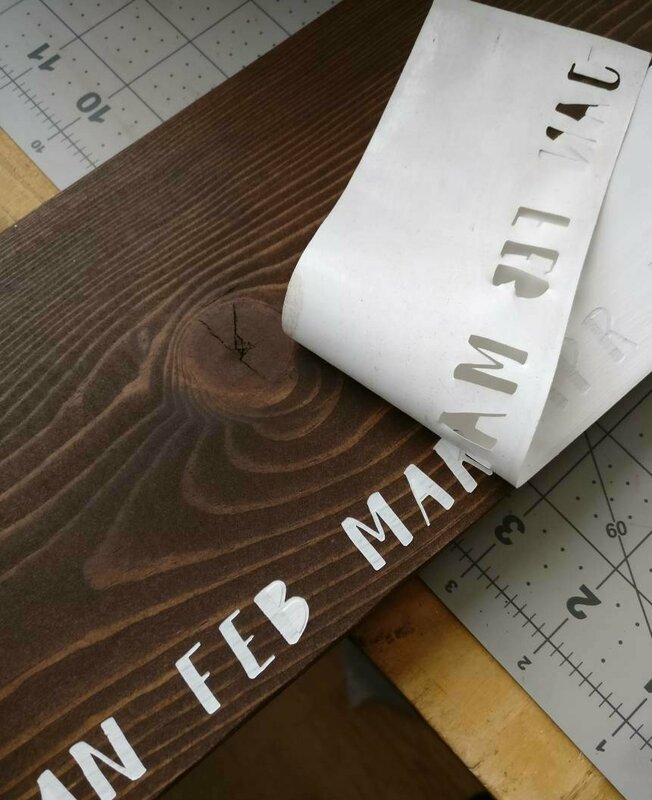 Try to match the color of the “board” to the color of the stain you are using, so as best to find word colors that work well. 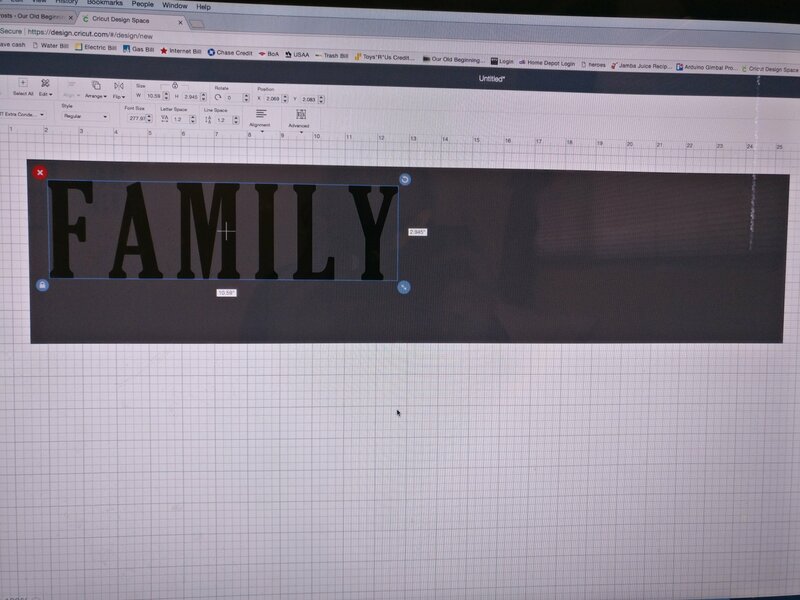 Adjust the widths and heights depending on the length of your name. 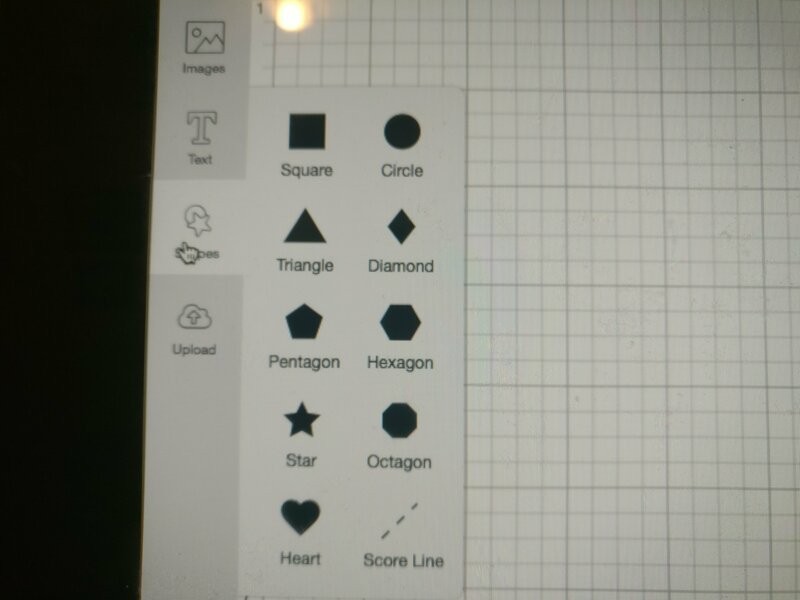 Hide the rectangle, and “make” the cut. 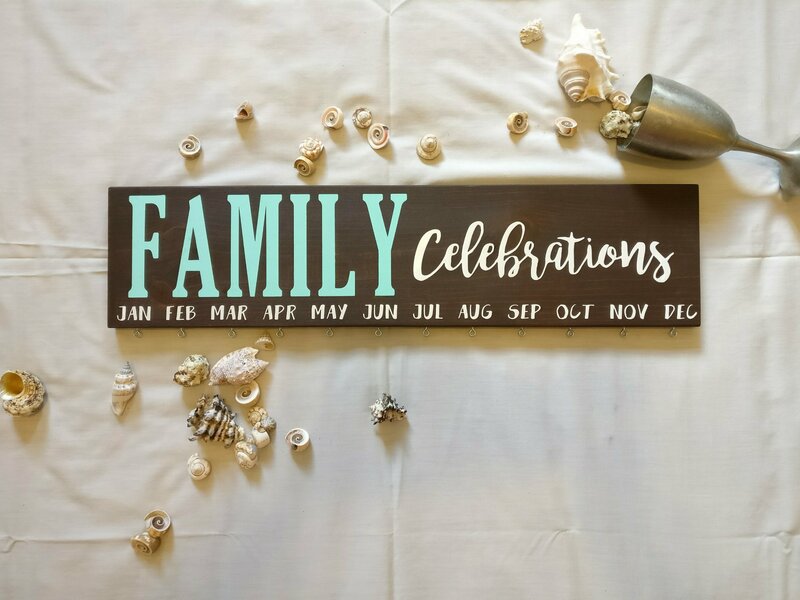 Apply the white vinyl to the mat for the months and “Celebrations.” Adjust your words, and make the cut. 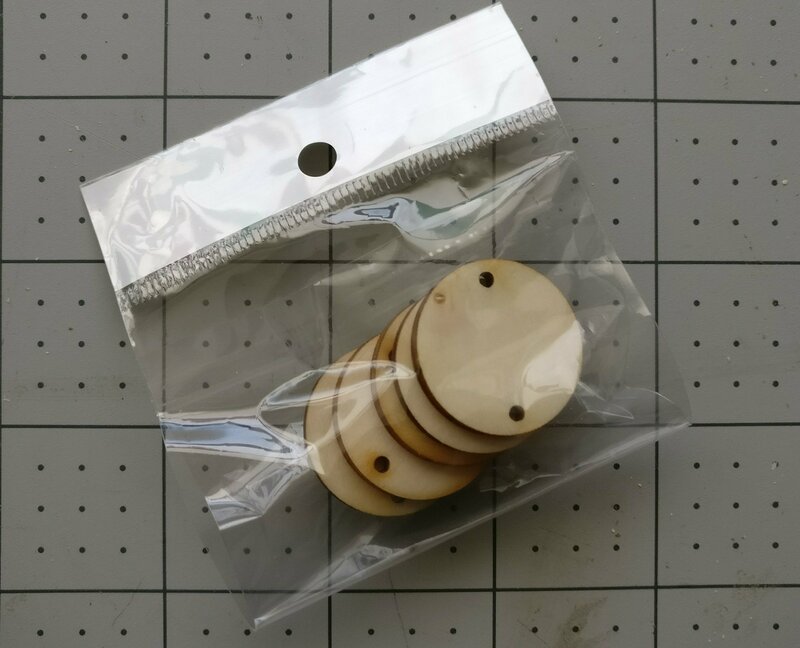 If you are putting down vinyl on your board, you don’t need any extra room. However, if you are painting, give yourself a few inches of blank space as a cushion. 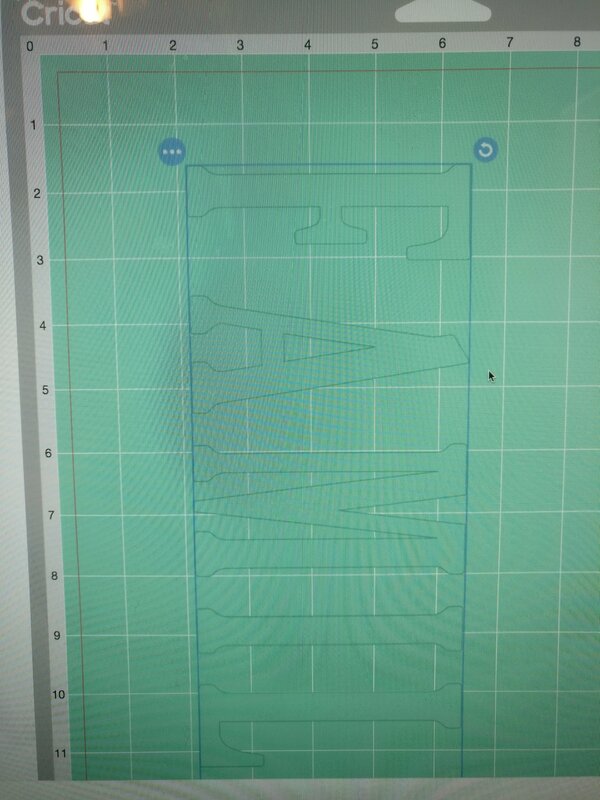 Apply your stencil vinyl to the mat, and cut out your name. 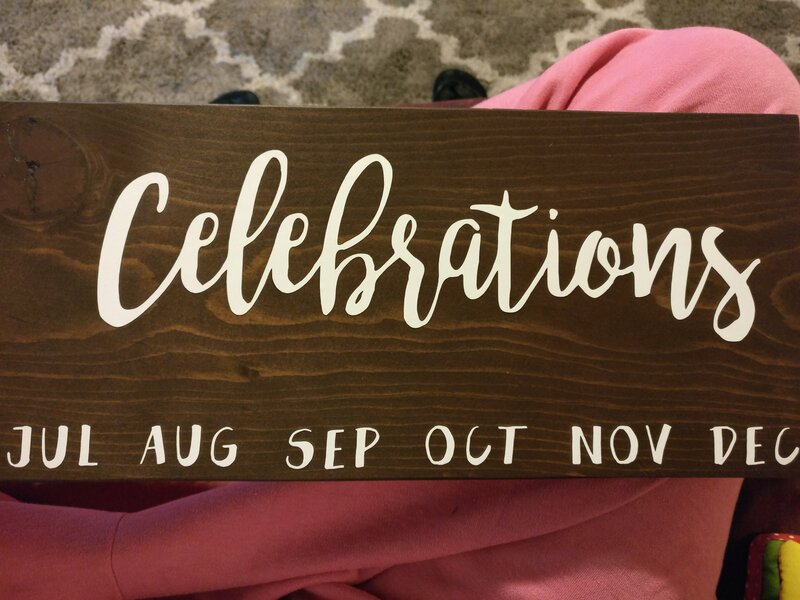 At this point, you should have the months and “Celebrations” cut out in white vinyl, and your last name cut out in your stencil vinyl for painting. This part can get…tricky. But it’s fun. 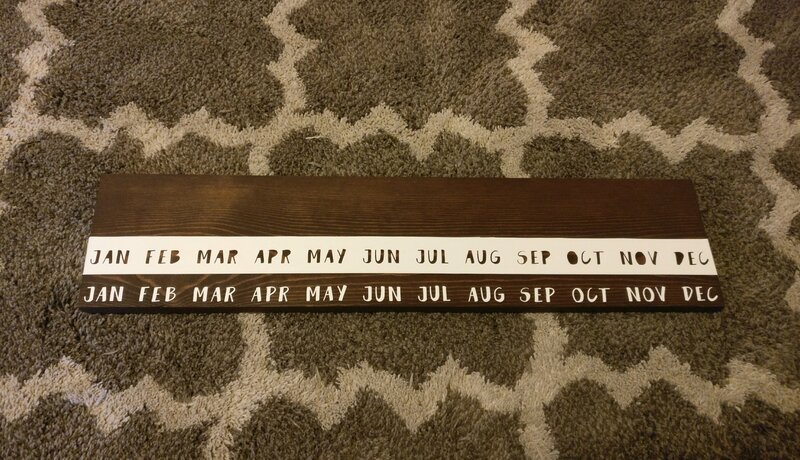 Then, apply the letters of your months in a straight line, about 1/4 inch from the bottom of the board. 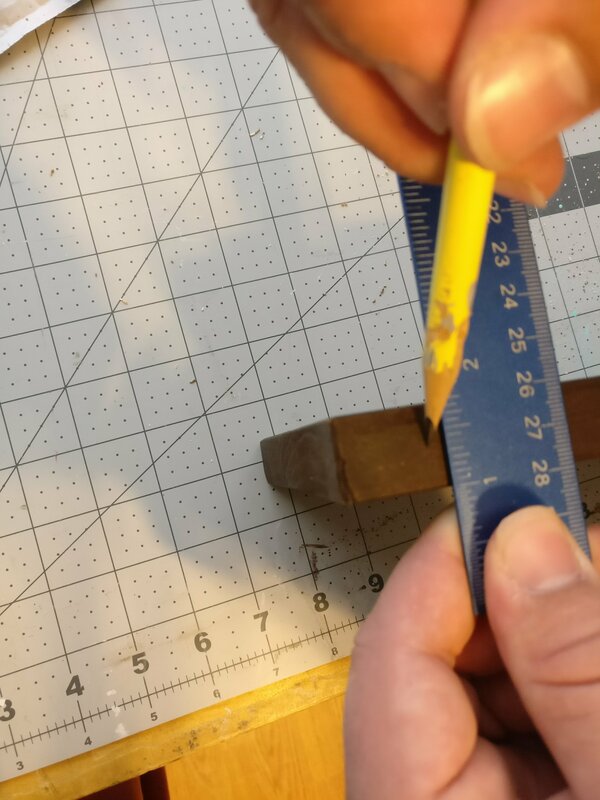 Use the spacing of the top piece as a reference. Tip: I’m cheap, but transfer tape would help this go a lot faster. 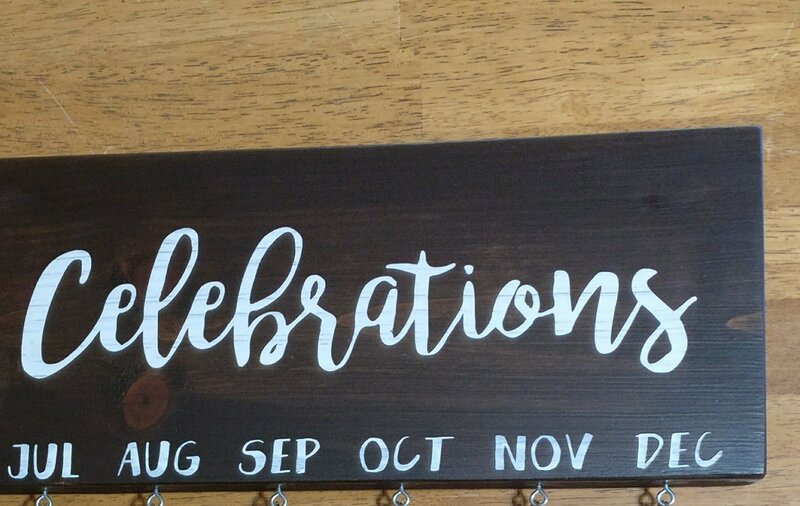 Once your months are all down, apply your “Celebrations” vinyl cut out to the board. Peel it off veeery slowly…. …and then lay it down. This can be really tricky, because the letters like to stick together. 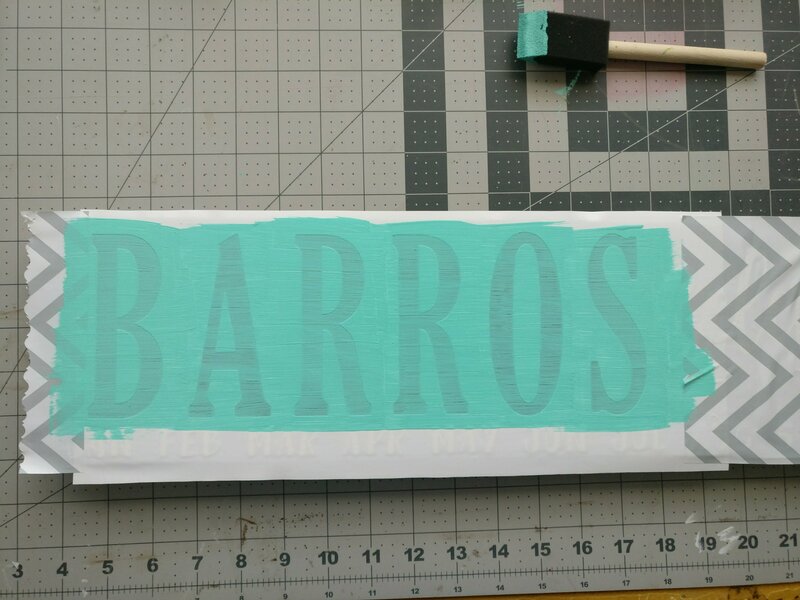 I reeeeeally should invest in some transfer tape (I hear that Glad Press n Seal works? ), but at one point, it almost always looks like this for me: Eventually I get it down, but sometimes slightly crooked… As you can (maybe) tell, the first half of the word is angled upwards. 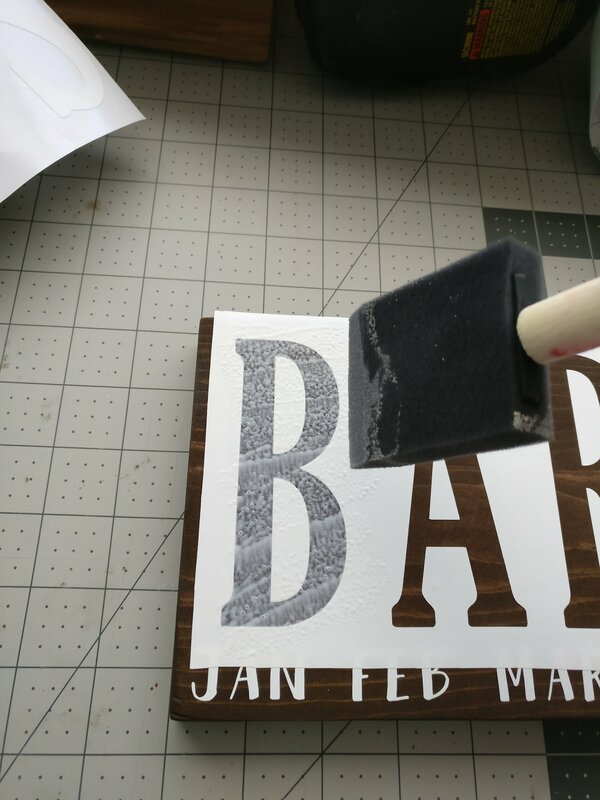 Remember that the letters bounce and lean, so you may have to (carefully) pull it up and reapply several times until your word comes out straight. That is, unless you use transfer tape. 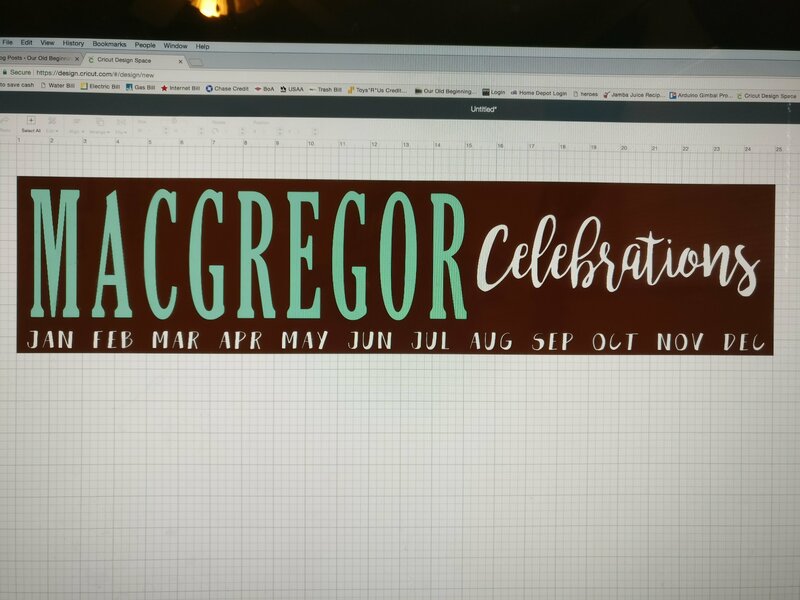 Now you should have your months and “Celebrations” down! Every board will look a little different. Time for the longest part. 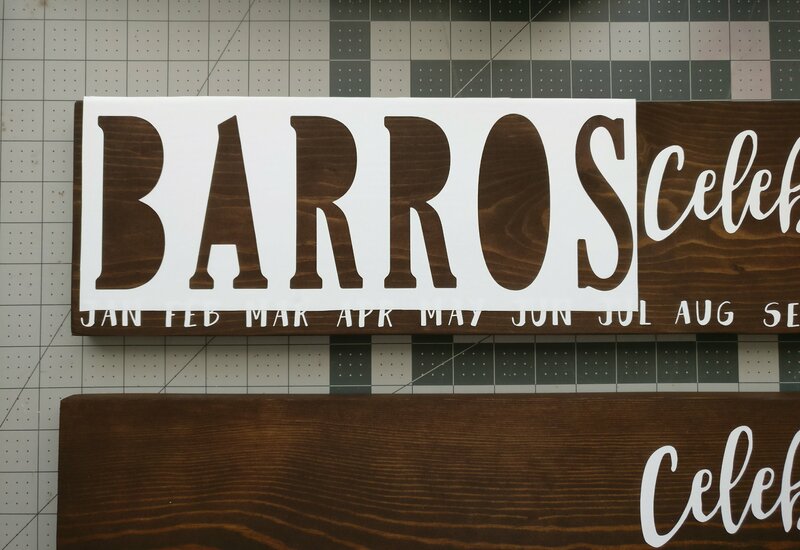 Take the vinyl name part that you cut out, and pull it off. Stick it down on your board, making sure that all areas are flat and not stretched or bubbled. Again, you will probably have to pull it up several times, and reapply it in order to get it straight and flat. 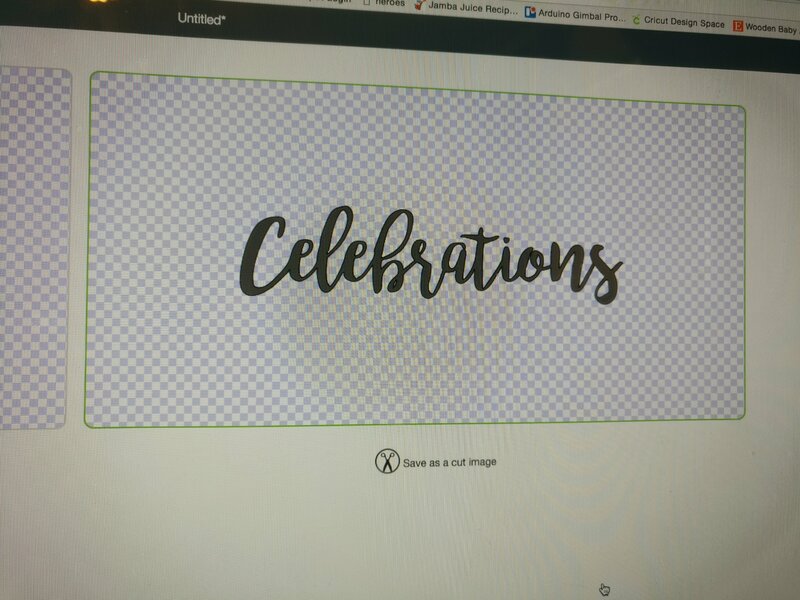 Make sure the spacing (in relation to the edge of the board, and the “Celebrations” word) is how you want it, and that it matches the opposite side of the board. And press everything down really flat. Use your finger to go along every edge, especially around and inside each letter. 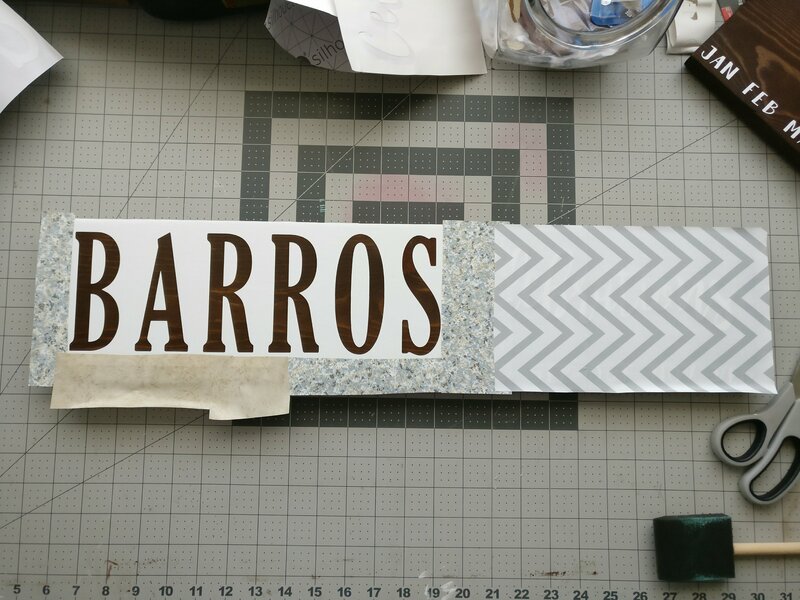 Take your mod podge… And pour a little on a plate or disposable surface. 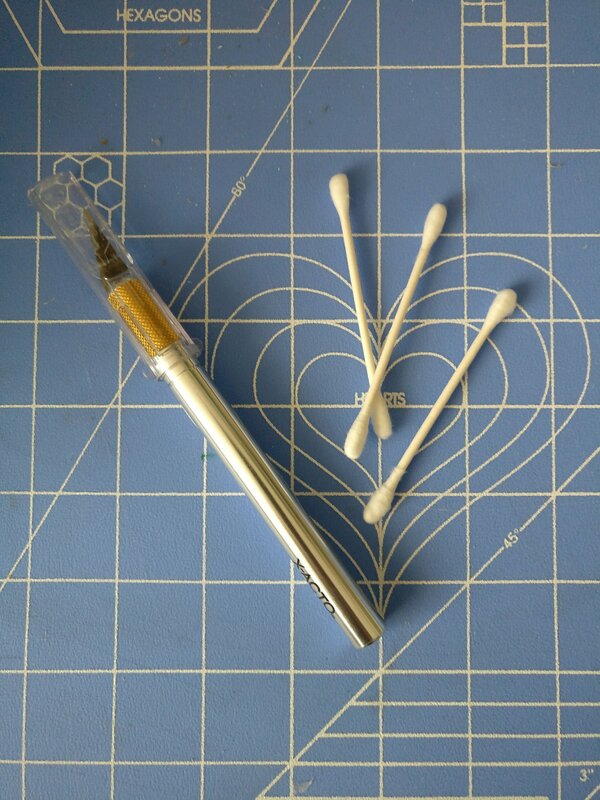 Next, dip your foam brush in, getting a decent amount on the brush. 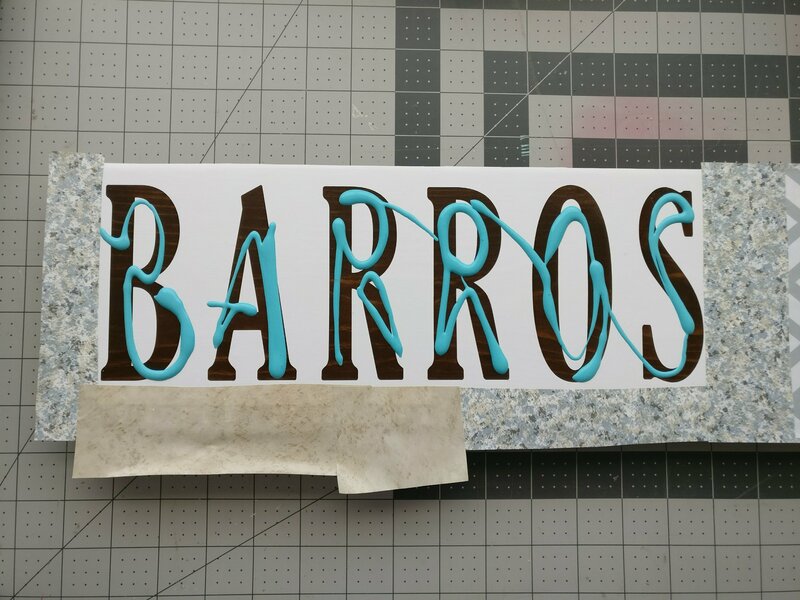 And then begin sponging mod podge onto one of the letters. Don’t brush it yet. Your purpose now is to cover the surfaces and get the sides evenly covered. 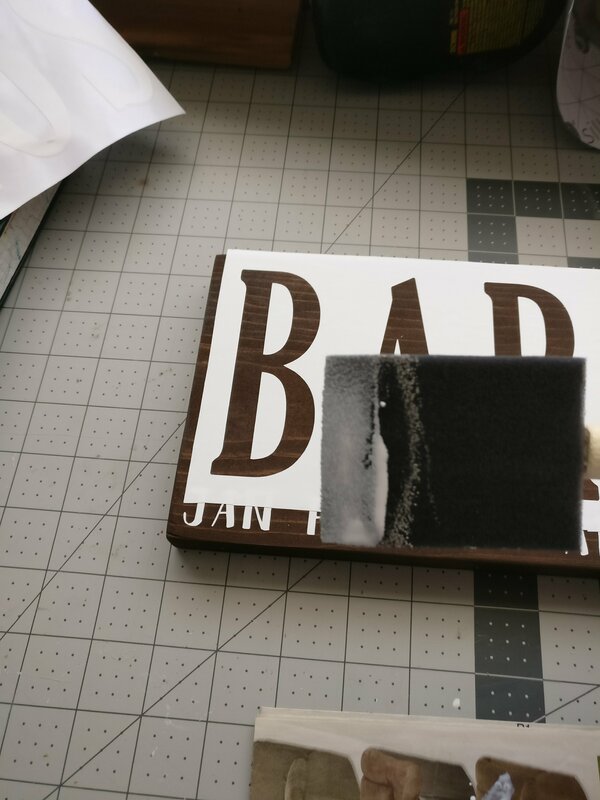 Next, take your brush, and evenly brush the entire letter one direction, and then the other direction, to smooth the mod podge and also to slightly concentrate it towards the edges. It doesn’t matter if it’s perfect, cause it will dry, and it will be covered with paint. 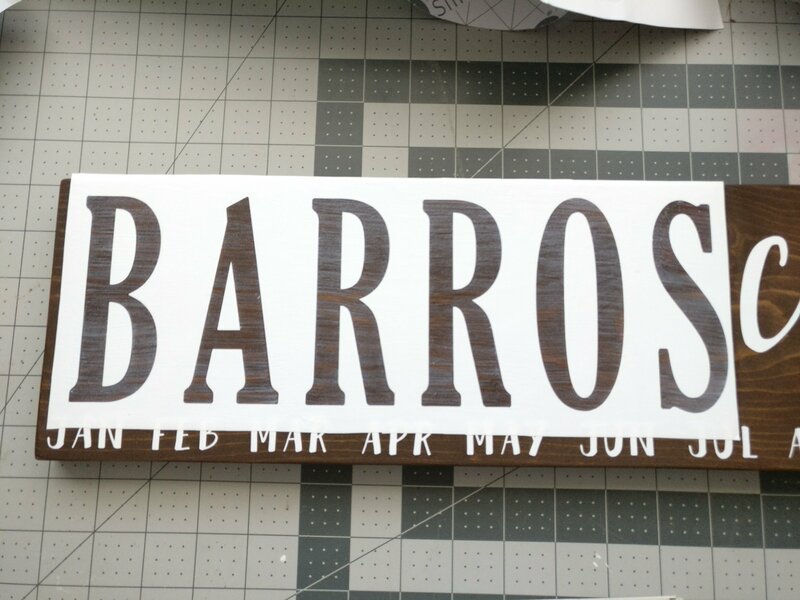 Do that same process to each of the letters. Wait for it to COMPLETELY dry. Walk away and do something else. 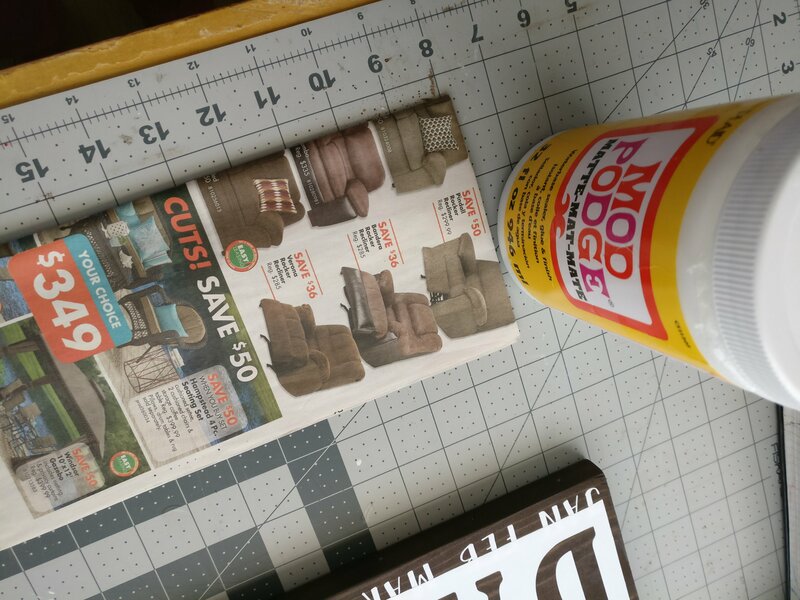 Don’t start the next steps when the mod podge is still a little gummy. 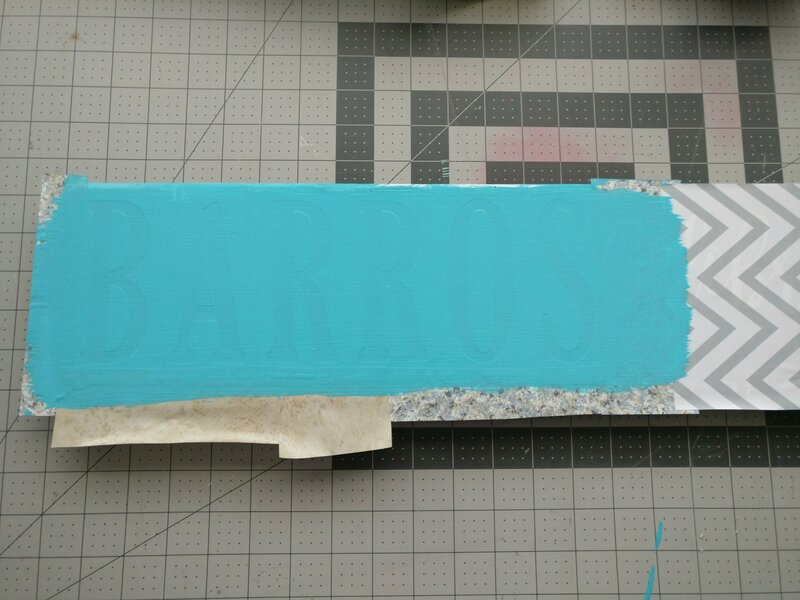 Next, using low quality contact paper (or newspaper and painter’s tape), cover the rest of the board completely. I just use scraps of old contact paper. 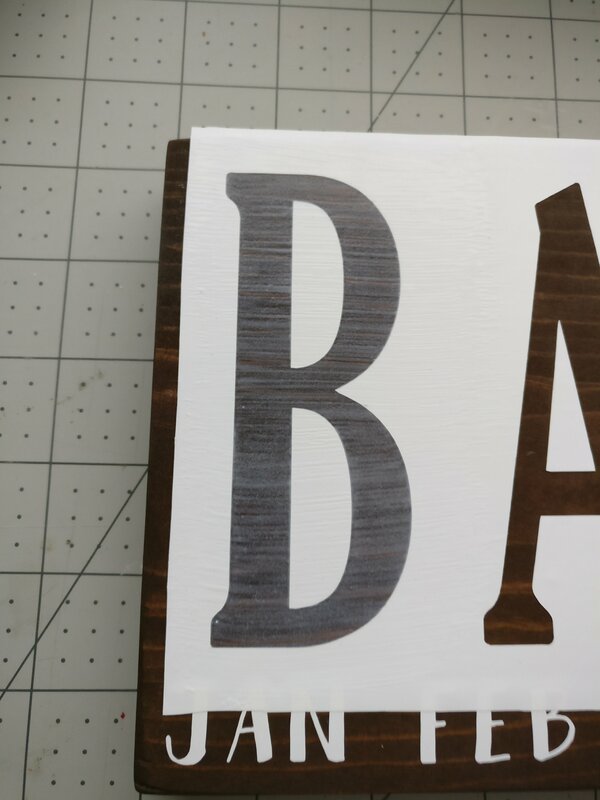 And don’t use high-quality vinyl or contact paper for covering your board, because it will pull up your vinyl letters with it, and pull them right off the board. Super annoying to fix. It’s definitely worth covering the rest of the board before you paint. You don’t want to know how many hours I’ve spent fixing areas where paint accidentally dripped or splattered. 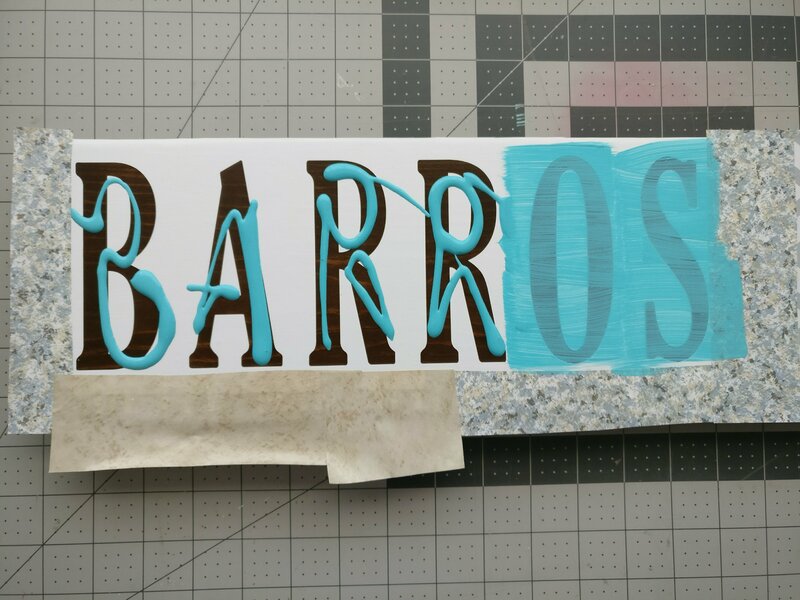 Then, using a foam brush, go letter by letter and spread the paint evenly back and forth to both sides. This is just your first coat, so don’t be too particular. 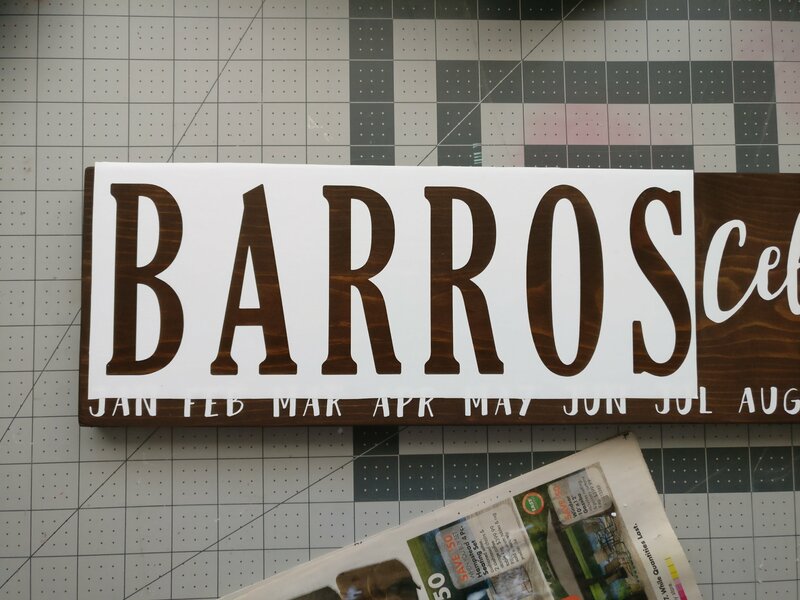 Working somewhat quickly, finish all of the letters this way. And then WAIT. I waited about an hour between coats. Do not try to speed this up, or you’re asking for a mess later. 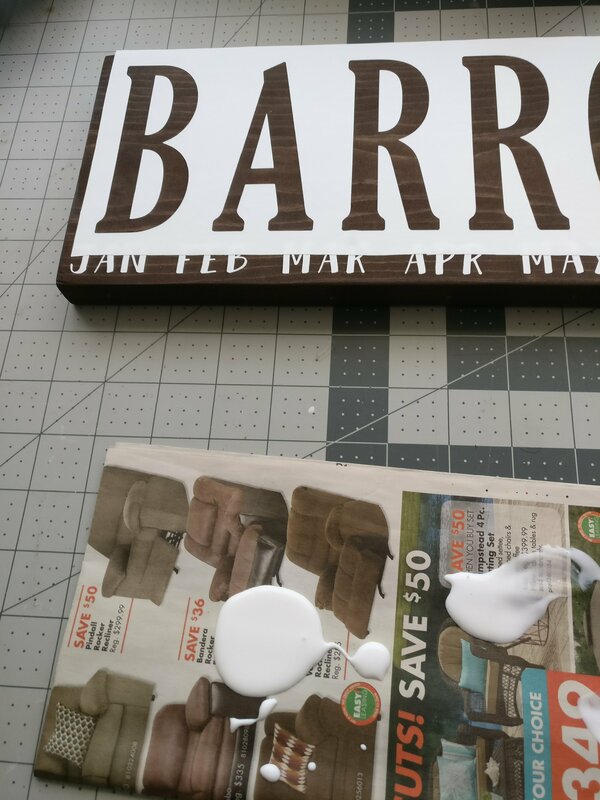 Using the same process, apply a second coat of paint. However, this time, extend your brush strokes across the entire word, for continuity. Then WAIT. Extra long. Like 3 hours, just to be sure. You think it’s dry, until you pull it up and the paint pulls off or gums up or smears, and trust me, I’ve been there and it ain’t pretty, or fun. Just wait. Watch a movie or something. Or do Part #7 of this tutorial. 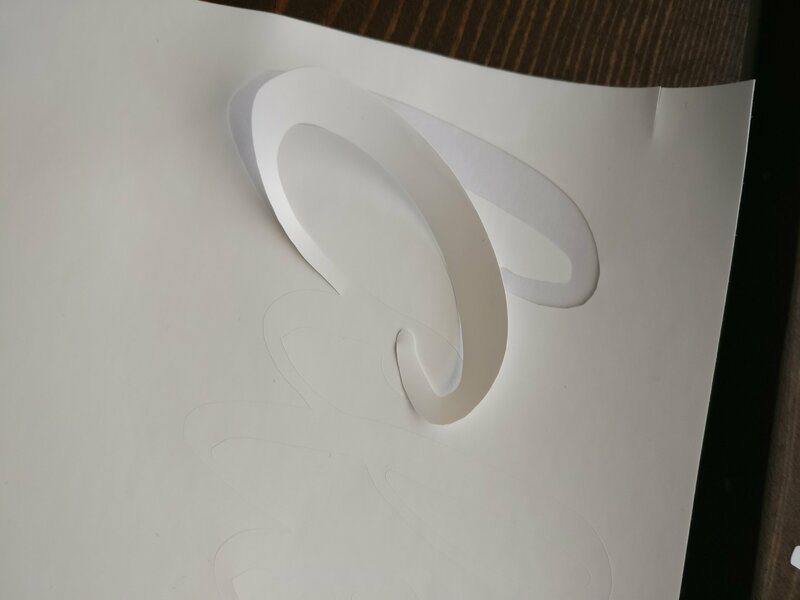 When it’s finally and perfectly and absolutely dry, carefully pull up the vinyl and the outside contact paper. The vinyl words you applied underneath might still try to pull up too, so work slowly and deliberately. I feel like this part is super important. 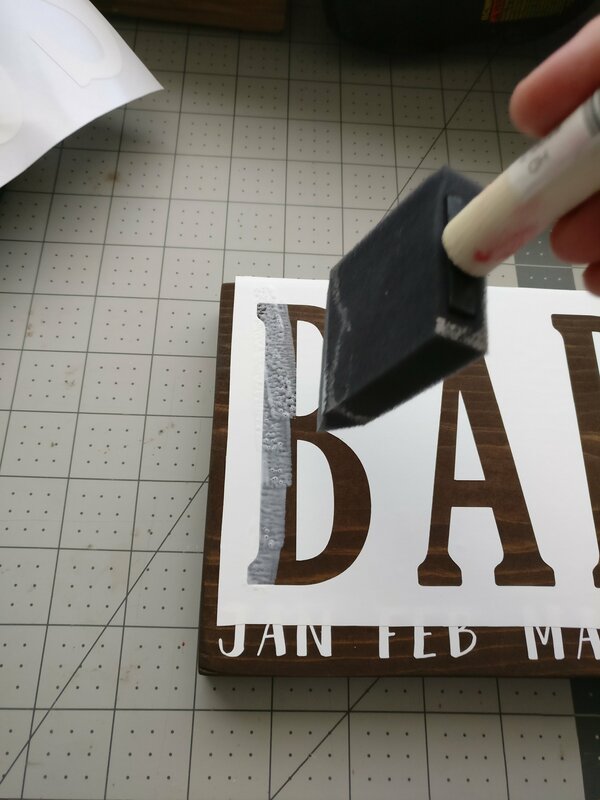 Spraying on mod podge makes the wood look a little richer, it seals in the paint, and it also helps the vinyl stay where it is. 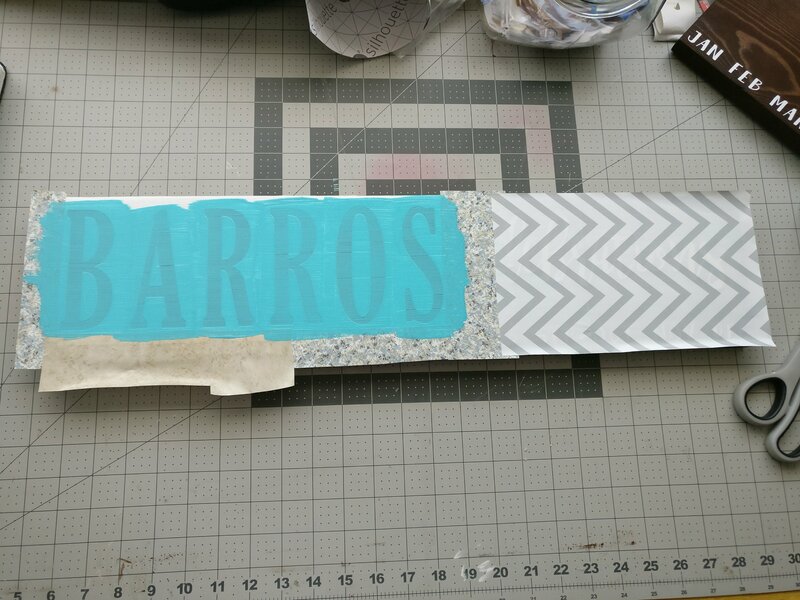 You don’t have to use spray-on mod podge for this, but it provides a lot cleaner look. I used a foam brush to apply mod podge for my first couple of boards, and it was a pain to get the look uniform, and left little streaky lines on the board. Behold. So just use the spray stuff. 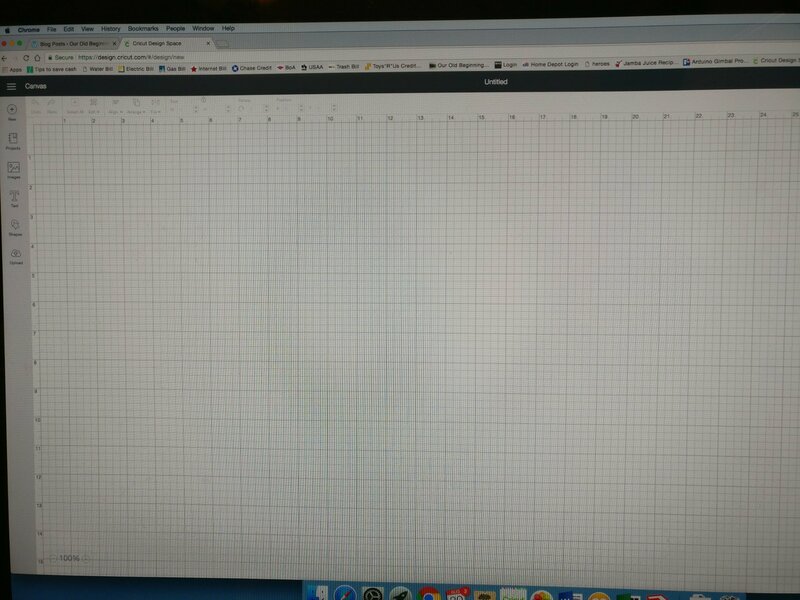 It works, and it looks great. You can’t even tell it’s on there, but it’s still doing the job. Let it dry, in a safe place! 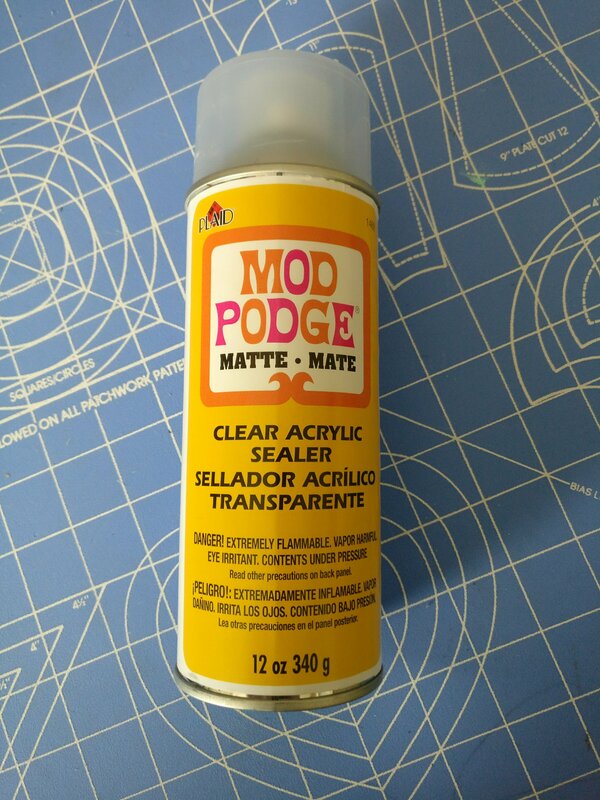 Don’t shortchange the process, and don’t leave it somewhere where dust is going to get stuck in the drying mod podge. 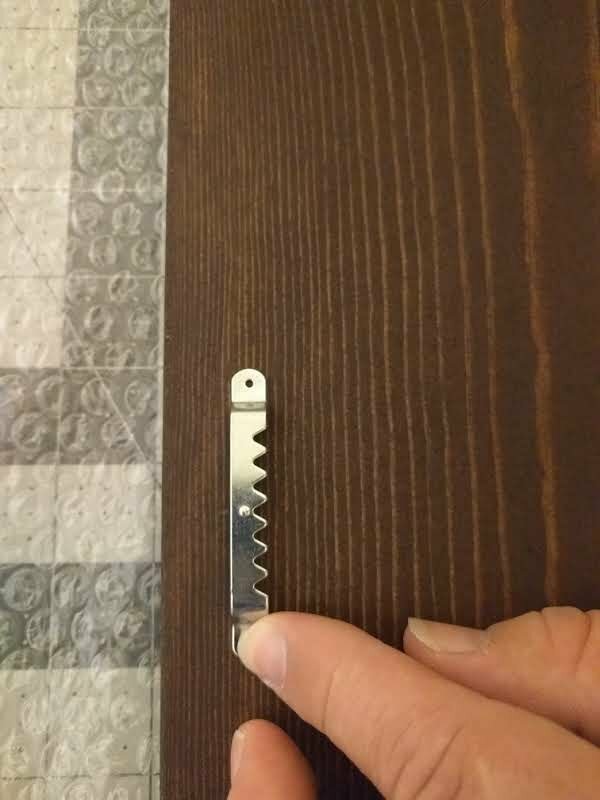 Now you have to take care of the screw hooks on the bottom of the board. 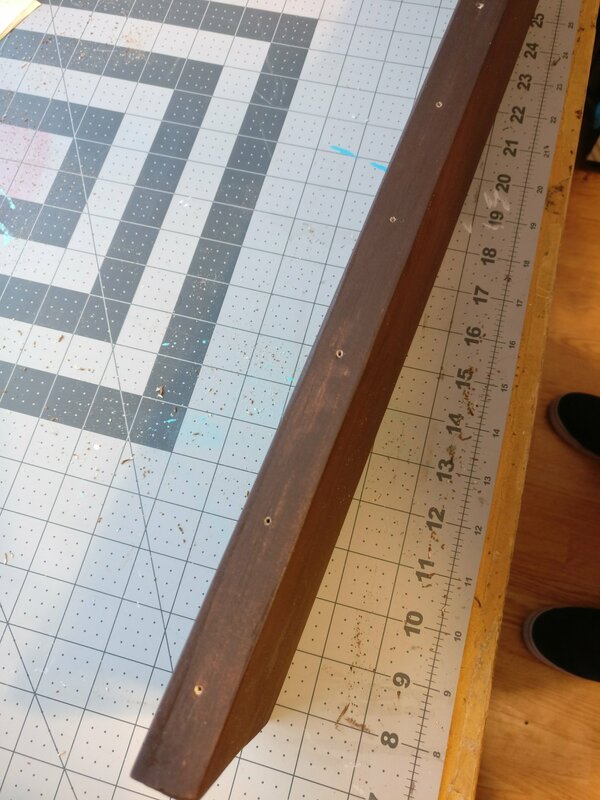 Measure halfway across the bottom of the board… and draw a line in the middle across the entire length of the bottom. 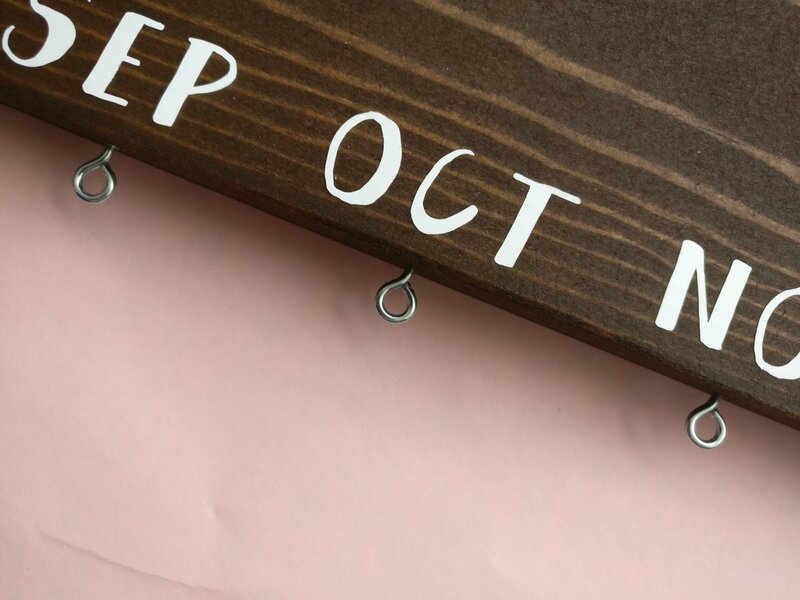 …then mark a little line under the middle of each month. 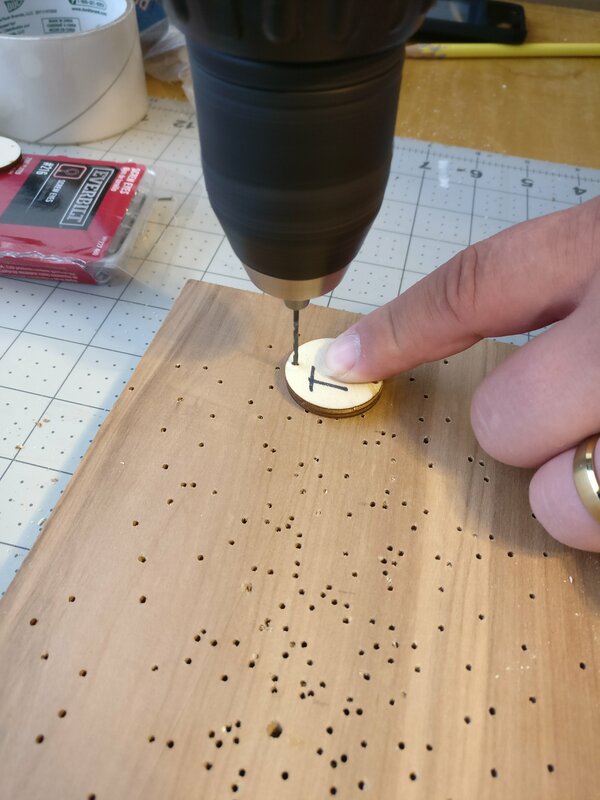 Drill a small hole at each mark, for the screws to go into. 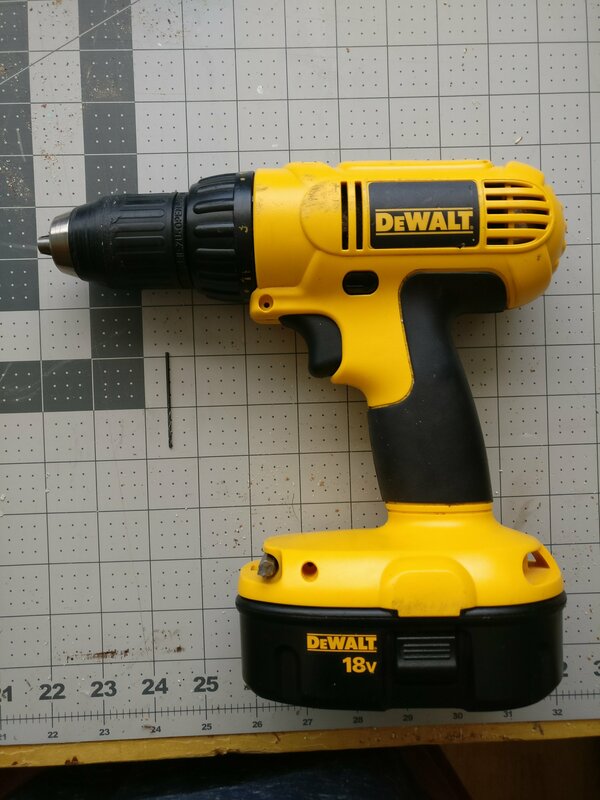 We use a super tiny bit for the size of screw hooks we have. Screw the 12 hooks into the 12 holes. 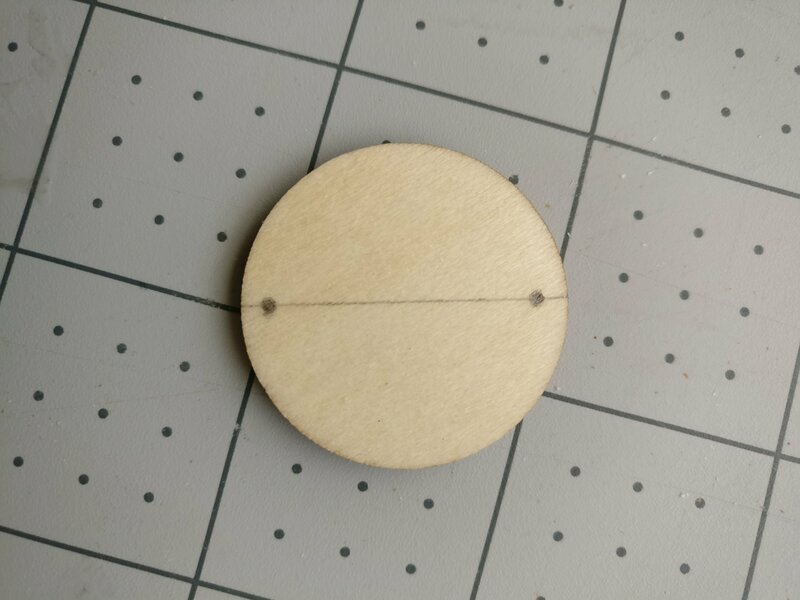 Make sure to screw them all in about the same deepness, and have the little hooks pointing the same direction. 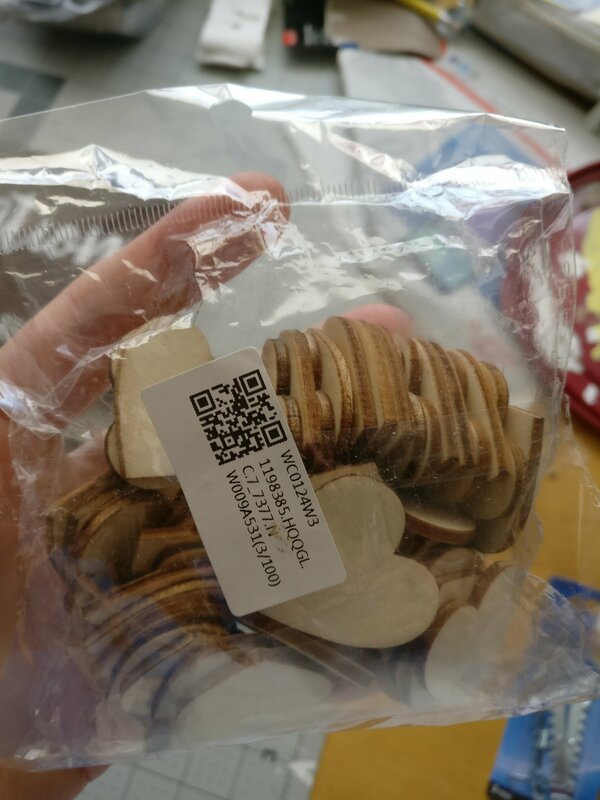 If you bought your circles and hearts with holes already in them, skip to step 4. Otherwise, go to step 2. Measure where you want your little holes to be – one at the top, and one at the bottom. 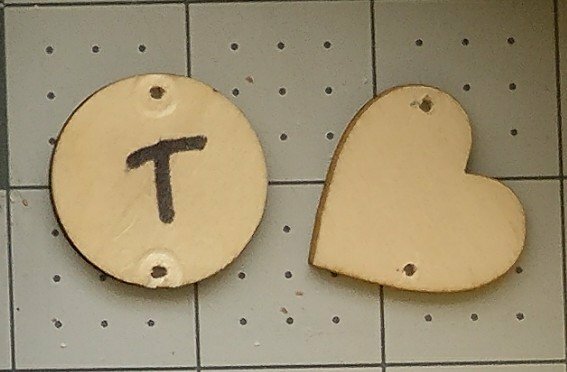 Using a small drill bit, create a template circle and a template heart, after which to drill the other circles and hearts. 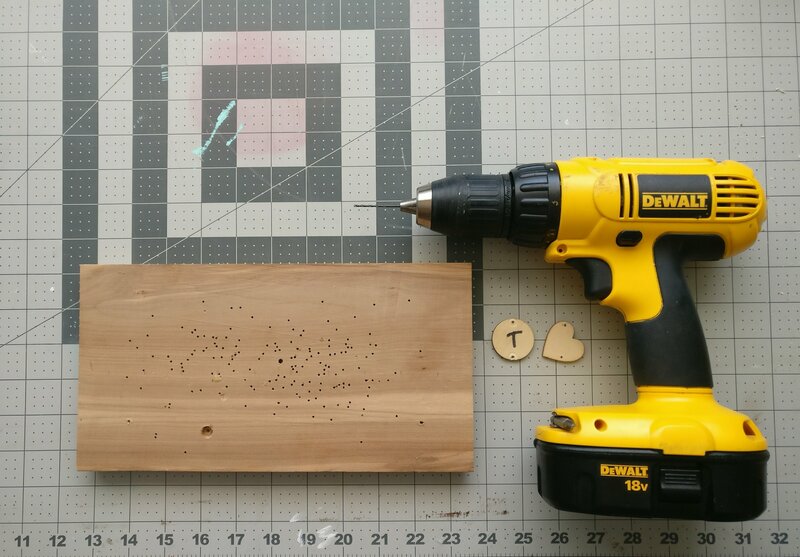 Carefully drill the holes in the rest of the circles and hearts. 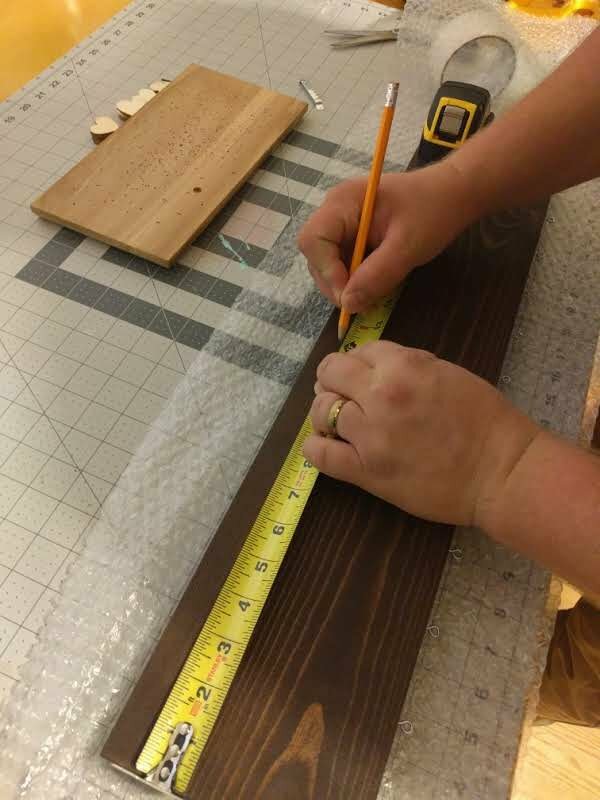 My husband can drill 5 at a time. I can only do two at a time haha, and it takes me forever. 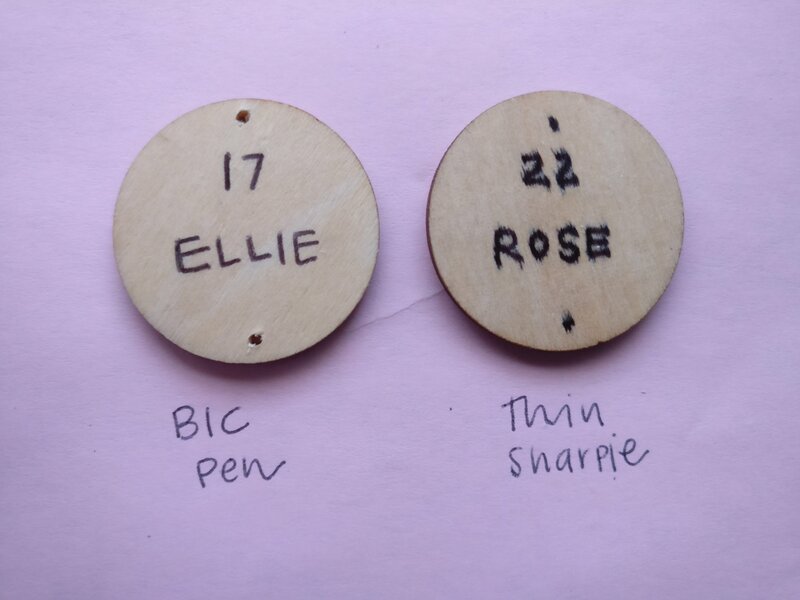 Using paper, and then a practice circle, figure out how you want the dates and names to look on your circles and hearts. Also practice with different pens and markers. The circles I use tend to bleed when I use Sharpies, so I just use a black Bic pen, and I trace over it so it’s darker. 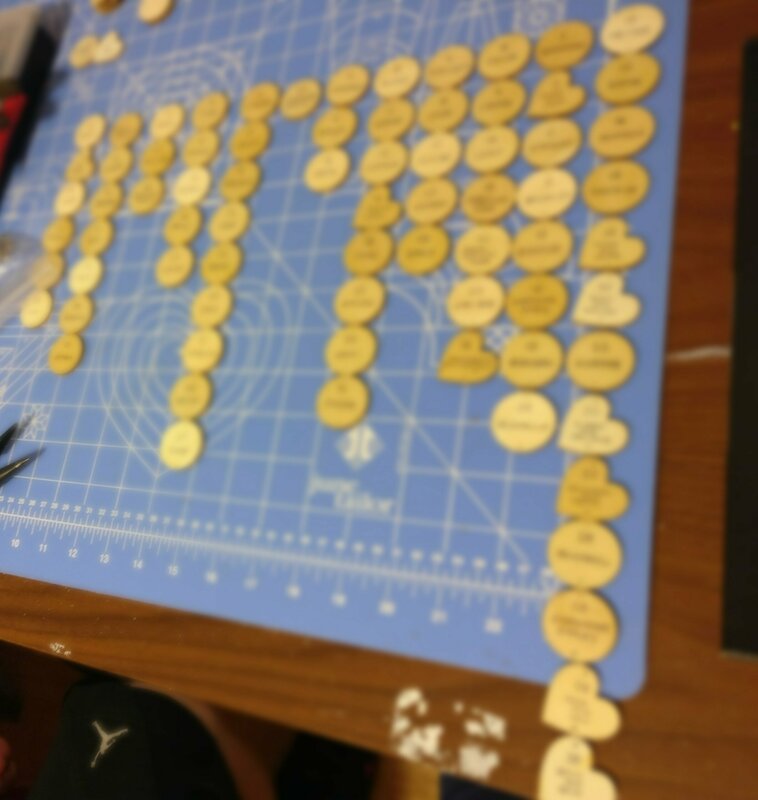 Once you’re all done, connect all of the circles and hearts together with jump rings. 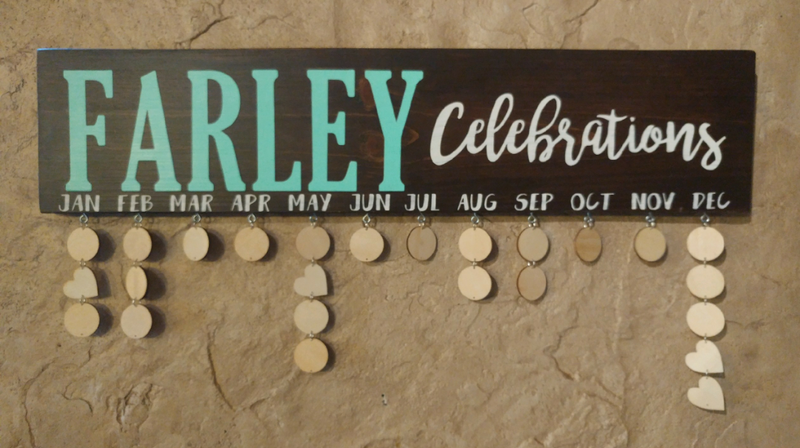 Connect each line of circles and hearts with a jump ring, to the screw hook under each month. 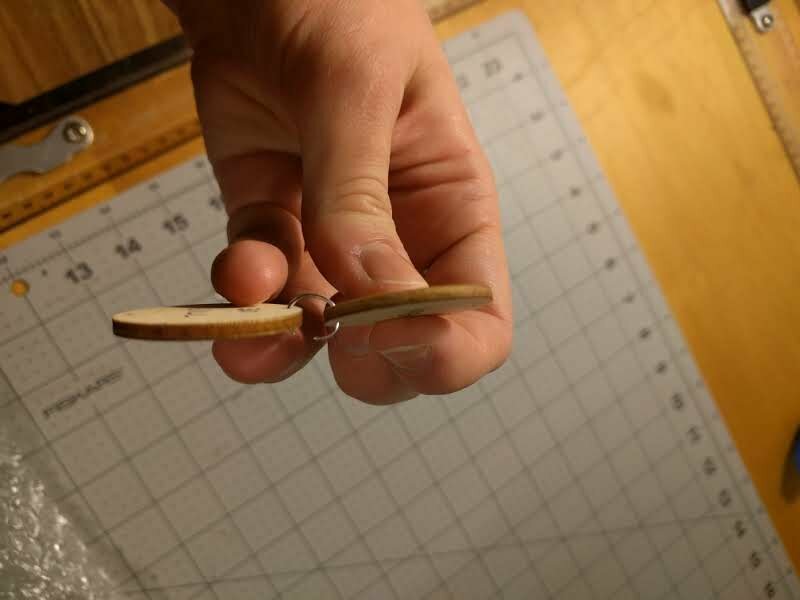 Take your sawtooth hook, and nail it to the back of your board, in the center. 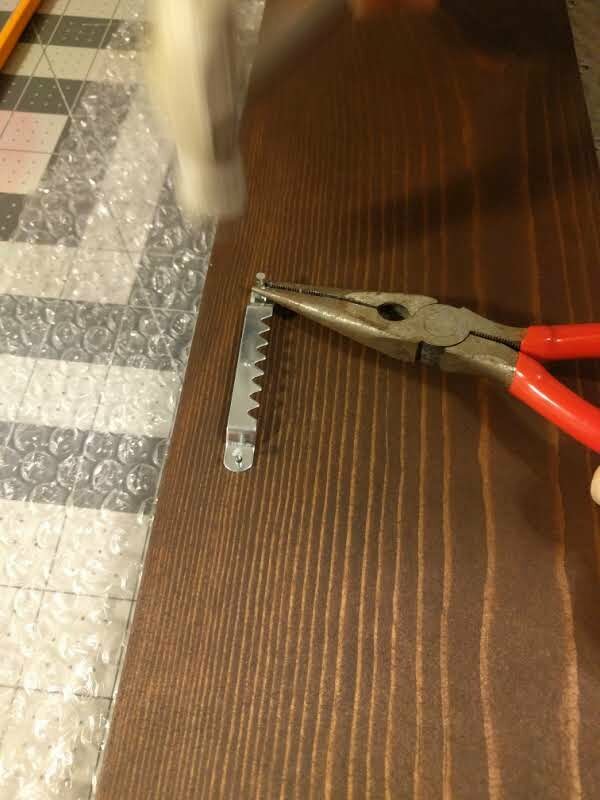 Make sure the board is resting on top of bubble wrap or a soft surface when you do this, or you’re asking for a dented board. We usually nail it about an inch from the top. Do your best to nail it in perfectly parallel. 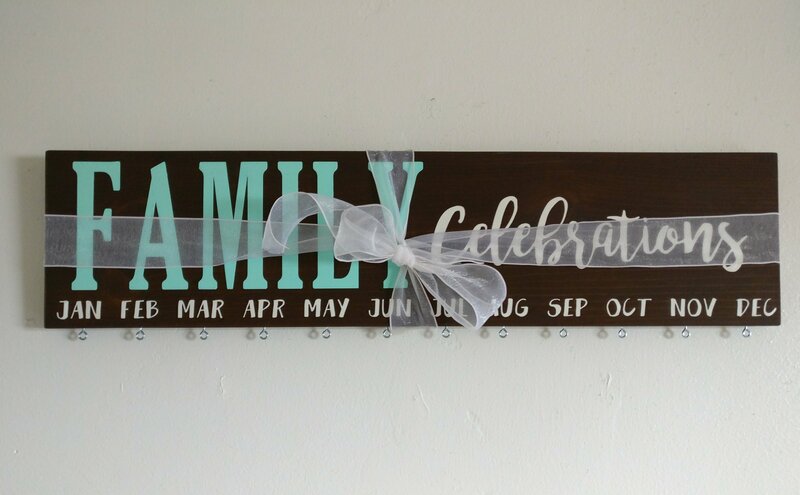 After all the effort you’ve put in, you don’t want the board to end up wonky on your wall. 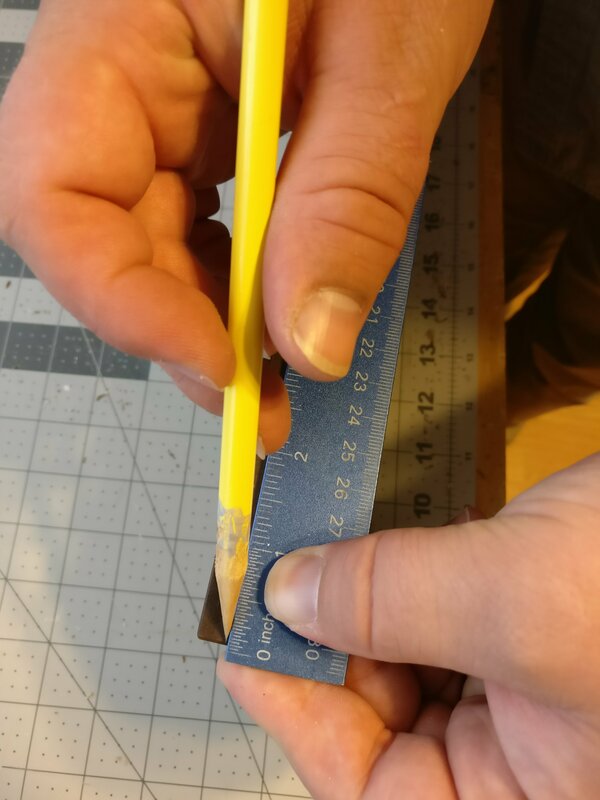 Tip: Use a pair of needle nose plyers to hold the tiny nails as you hammer. 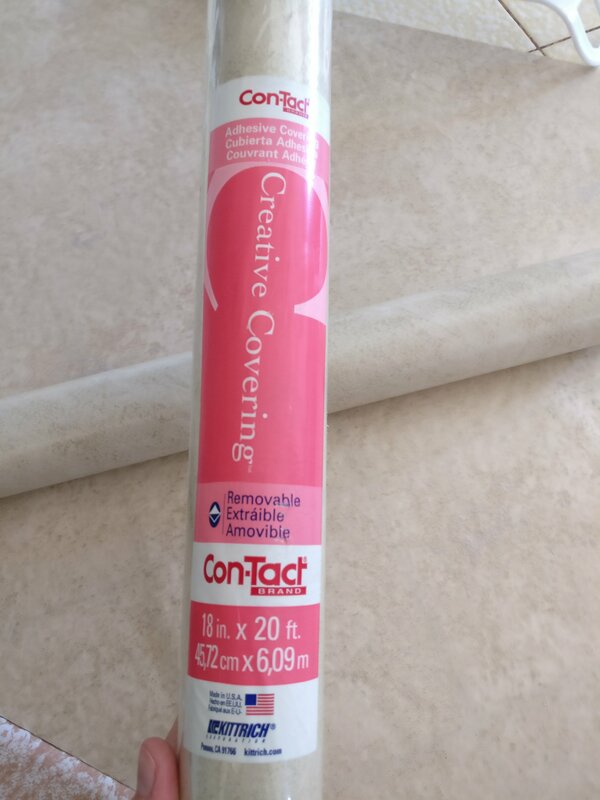 This will make the job easier, and it will save your fingers. 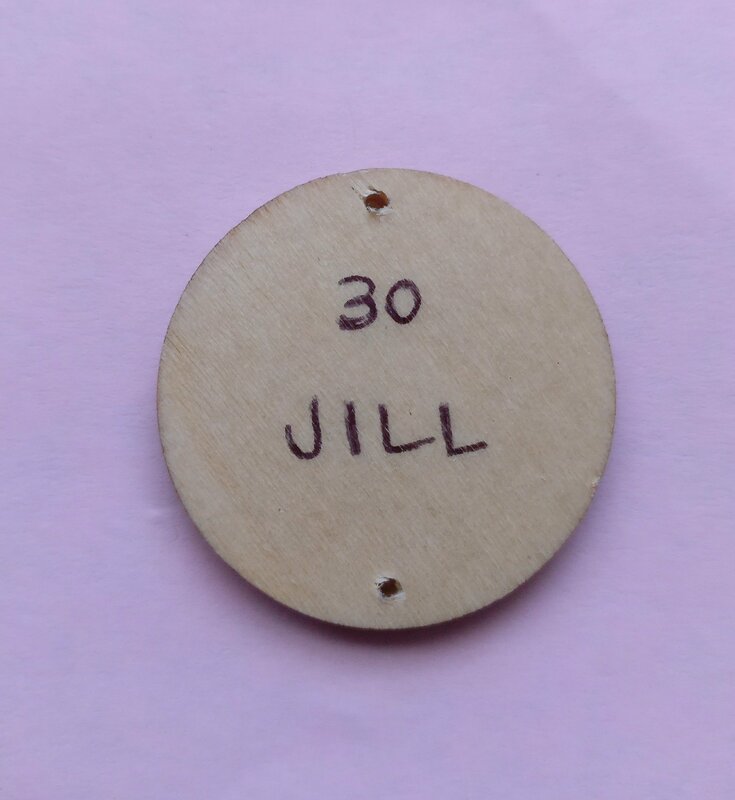 We like to take a little sandpaper and sand out a small area on the back of the board, to sign and date it. If you plan to give the board to someone as a gift, wrap it in bubble wrap right after you’re done. Don’t take any chances on it getting dented. We learned that the hard way. Hang it on your wall! 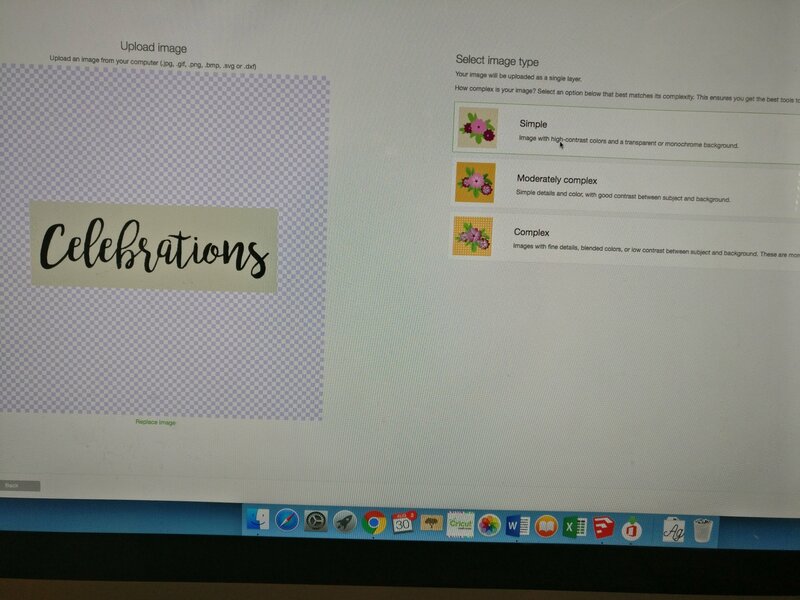 Now you have a finished and customized Celebrations Board, and a lot of work behind you. 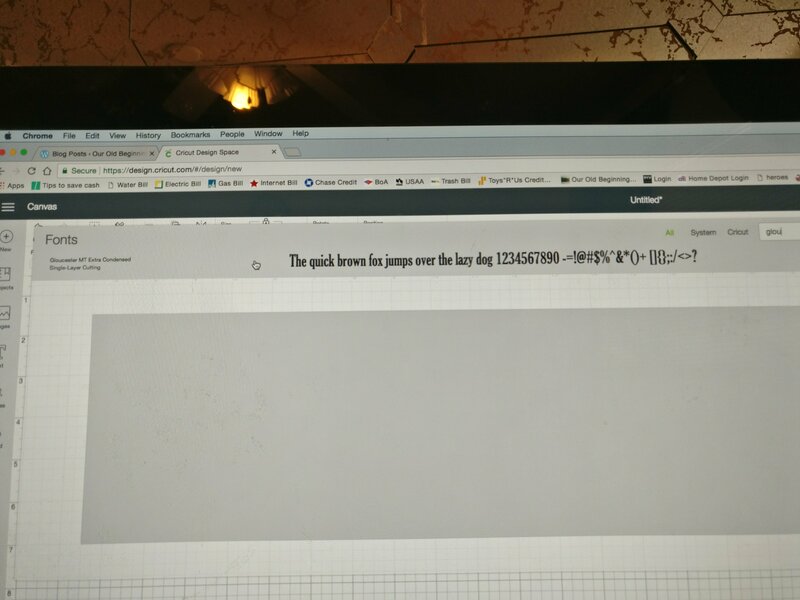 Let me know how this worked for you, if any part of the tutorial confuses you, or if you have any suggestions for me! 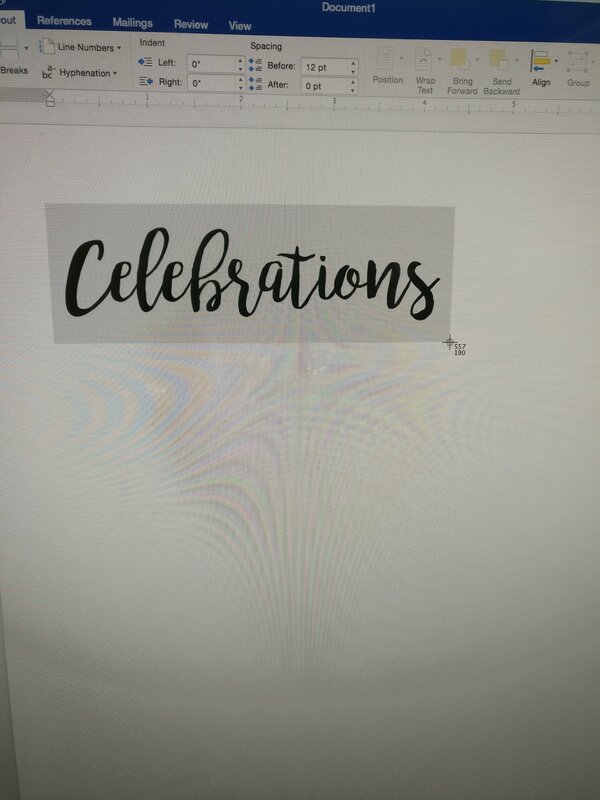 Comment with pictures of your new Celebrations board! 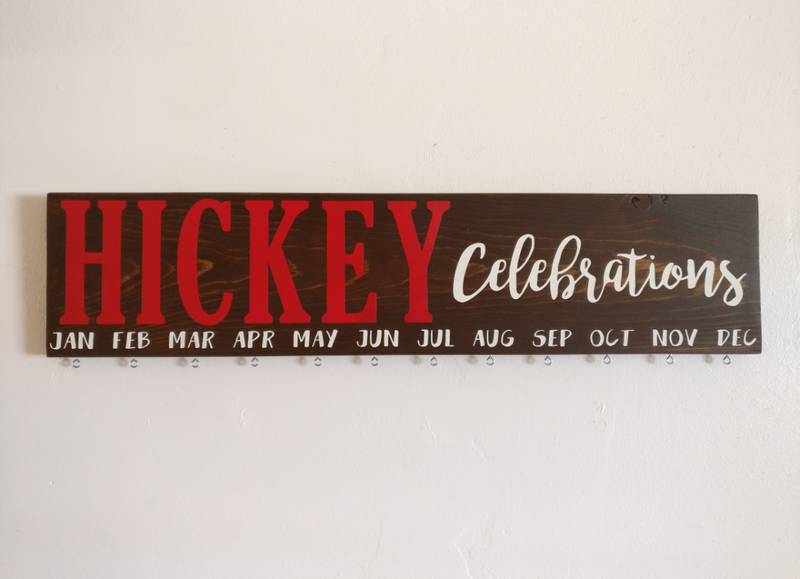 I desperately need one of these for my family birthdays! They’re really handy! 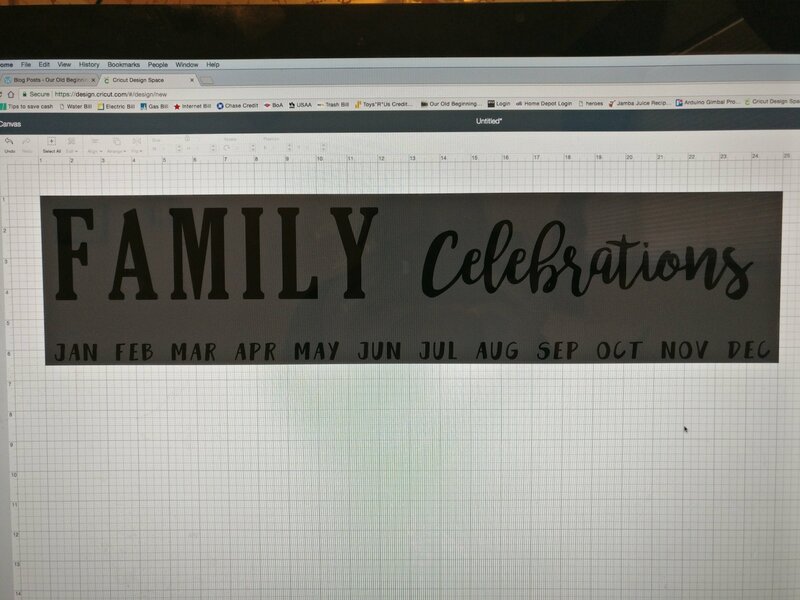 I have a billion people in my family, so it really helps keep track of everyone.